Chandler Woodfin is a draftsman, painter and co-founder of Feast Arts Center – an inclusive place for people from all backgrounds and skill levels to take classes, make art, and be part of a community. She received her BFA in painting from Columbia College and completed a 2 year apprenticeship program at Gage Academy of Art in Seattle. She has been teaching drawing and painting for 5 years at places such as Pratt Fine Arts Center, Gage Academy of Art, and Kirkland Art Center. To what degree do each of us affect and impact nature? Are we active participants in the natural world, or merely bystanders? And if we are indeed active participants, can we be a constructive force and not just a destructive one? 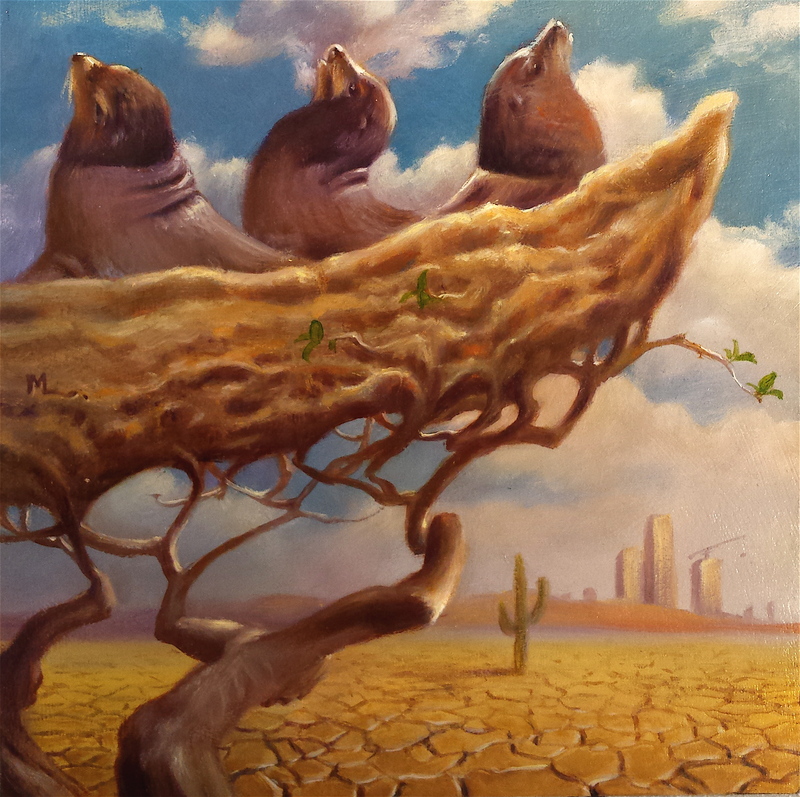 Timely questions like these are the driving force behind much of Mark Larson’s current body of imaginative realist work, which encompasses both large and small scale oil paintings and dry points. 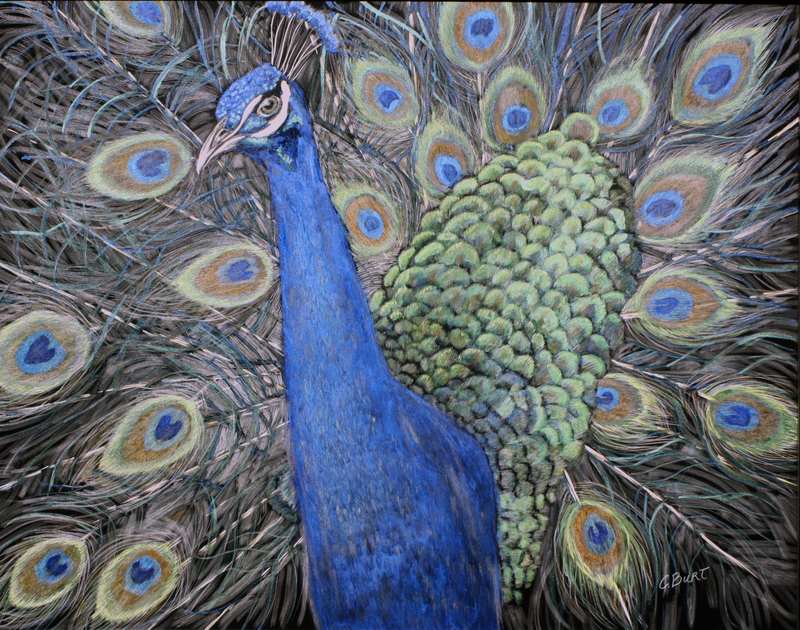 Carolyn Burt is a member of the International Society of Scratchboard Artists. 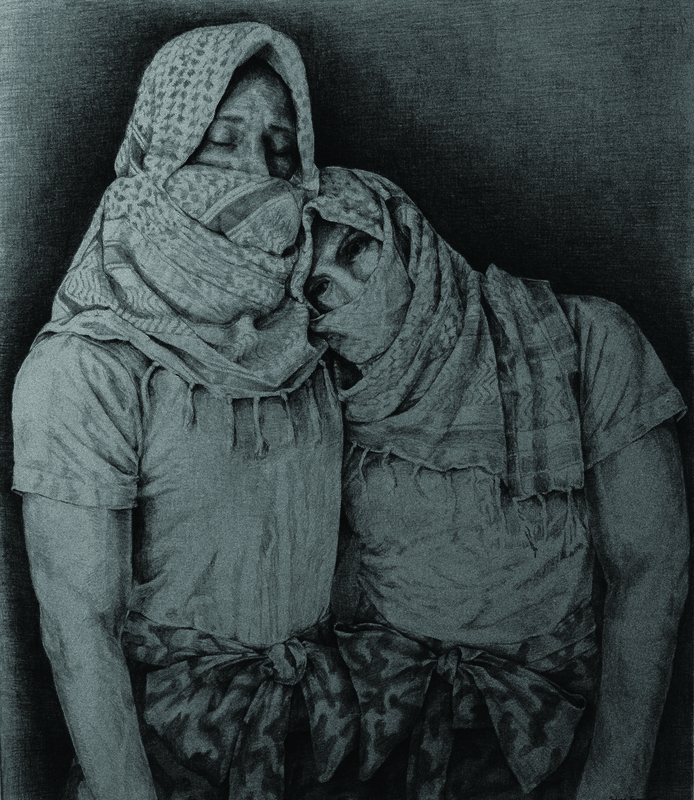 Her award-winning work is on display at Proctor Art Gallery, LLC. 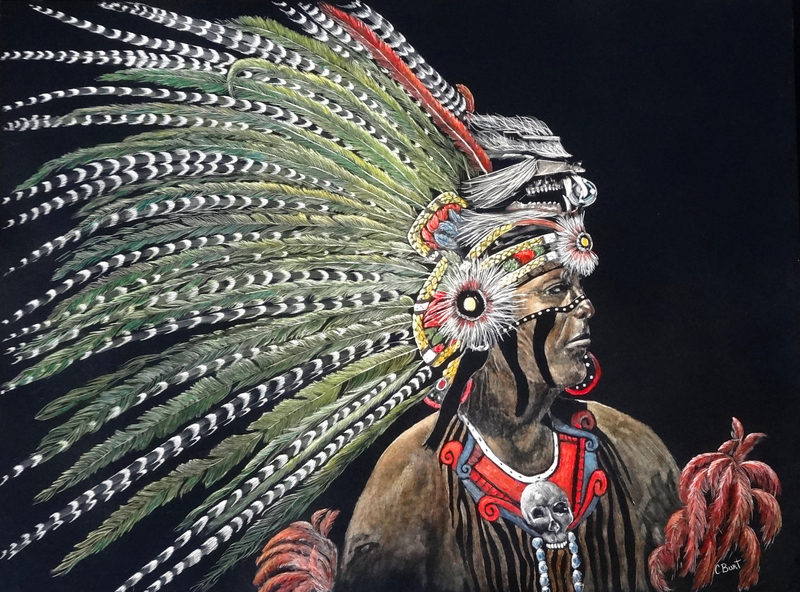 Each piece is finely engraved on museum-quality scratchboard, using a variety of precision engraving tools, x-acto knives, and tattoo needles. 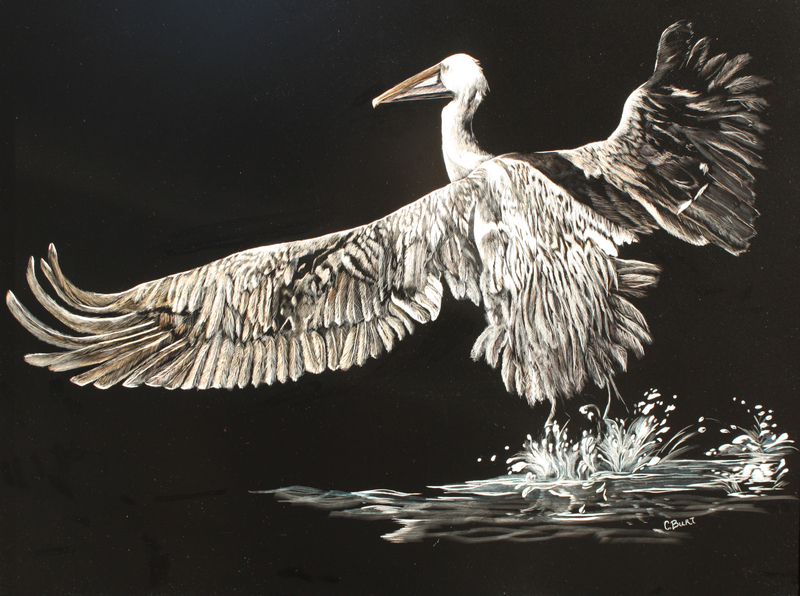 These one-of-a-kind creations are reminiscent of the fine detail in scrimshaw art. 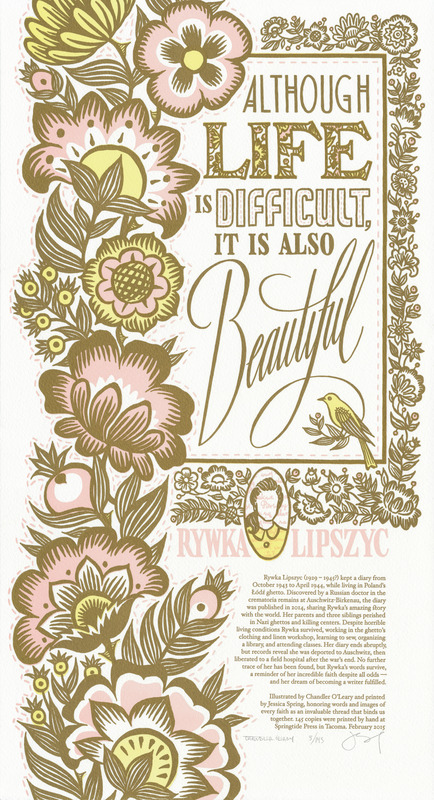 While some are black and white, others are colored with ink or watercolor, allowing the exquisite detail to show through. 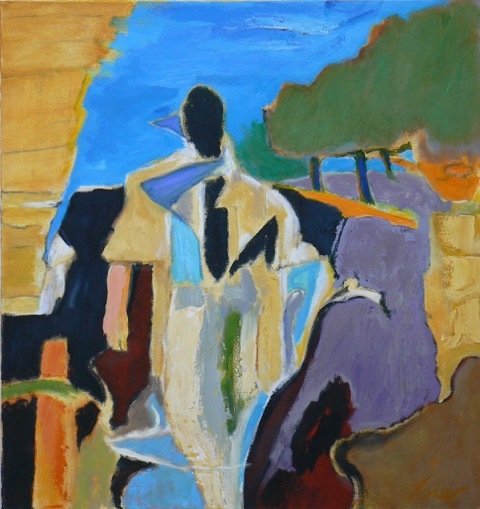 Figurative Abstraction is a motif William Turner often returns to in the flow of his work. 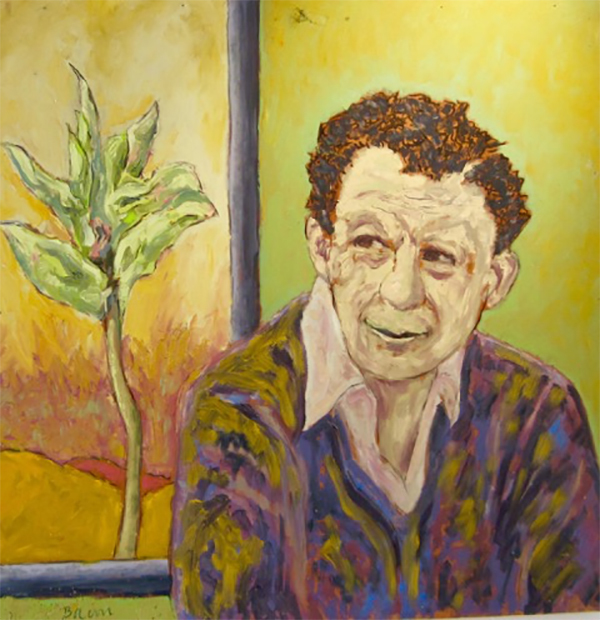 The paintings in his recent work referred back to a series of 12″ x 12″ oil studies he did ten years ago. With The Chanteuse Kiki he found his inspiration for his recent show at Ryan James Fine Arts in Kirkland. 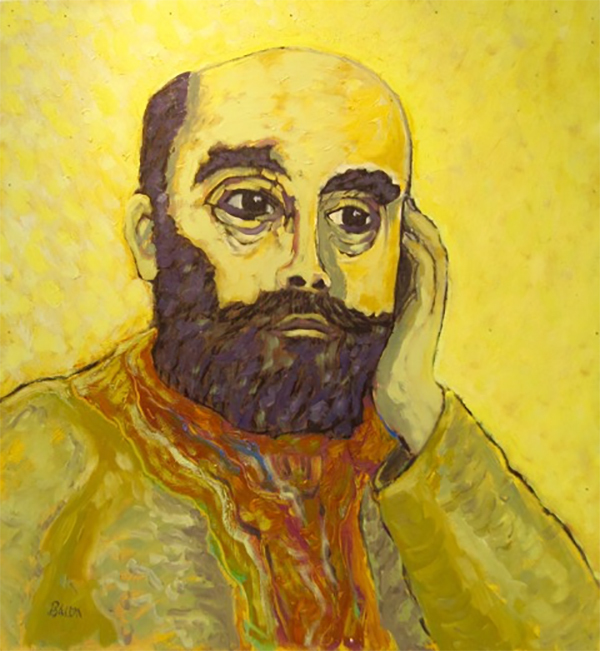 As with his Vincenzo Anastagi series, William took a character and created a visual fiction around her life. 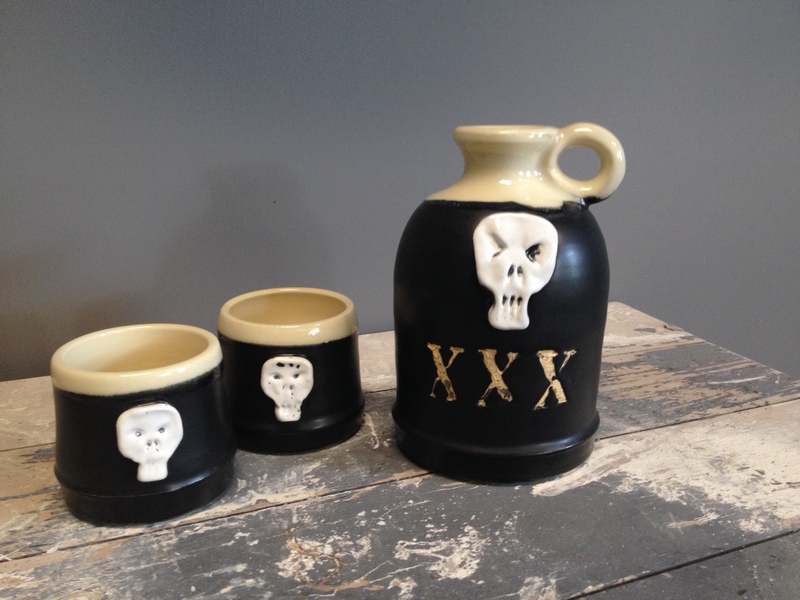 Tacoma-based potter Jenifer Davis’ passion is to create irreverently shaped functional sculptures and pots. 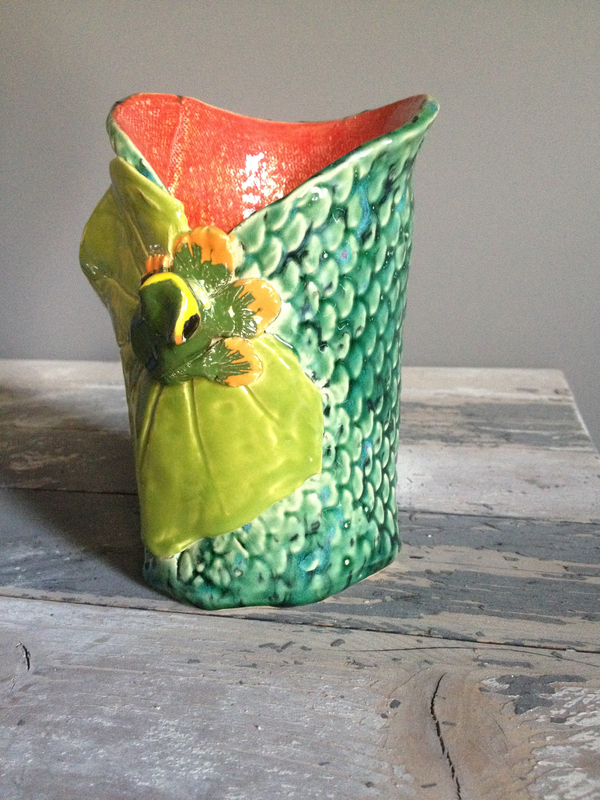 Jenifer offers both custom works, which she throws by hand in her studio for private clients, and classes. The hand-thrown process leaves a good deal of the outcome to fate. 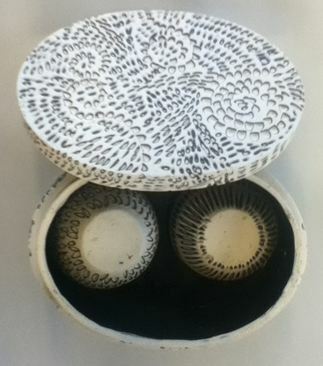 She also loves the randomness of the transformation in the firing process. 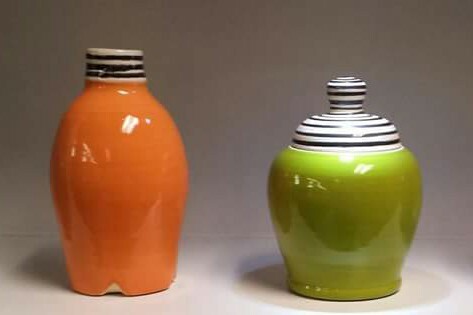 From adding glass to finding a new beautiful glaze combination, the best part is seeing what emerges after the kiln is opened. As a potter, Jennifer English explores the connections between heart, hands, and clay bodies. 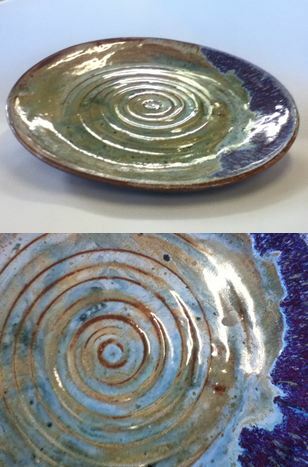 Jennifer produces works that pay special attention to the entire process of ceramics – from the throwing/sculpting to the leather hard, firings, and glazing stages. 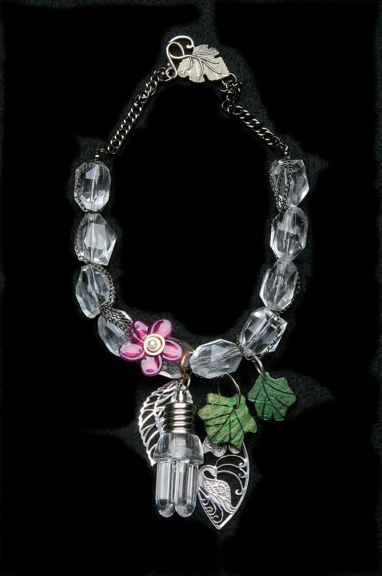 She enjoys hand building, intricate carving, and detailed glazing. 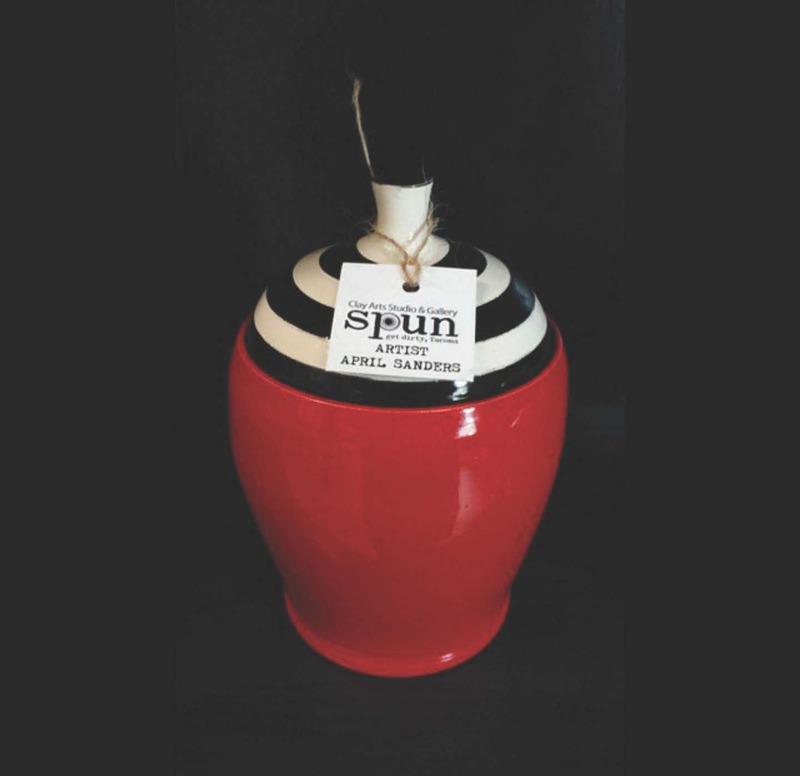 In 2014, through Spaceworks Tacoma, Jennifer and April Sanders started their own professional clay art studio and gallery, SPUN. 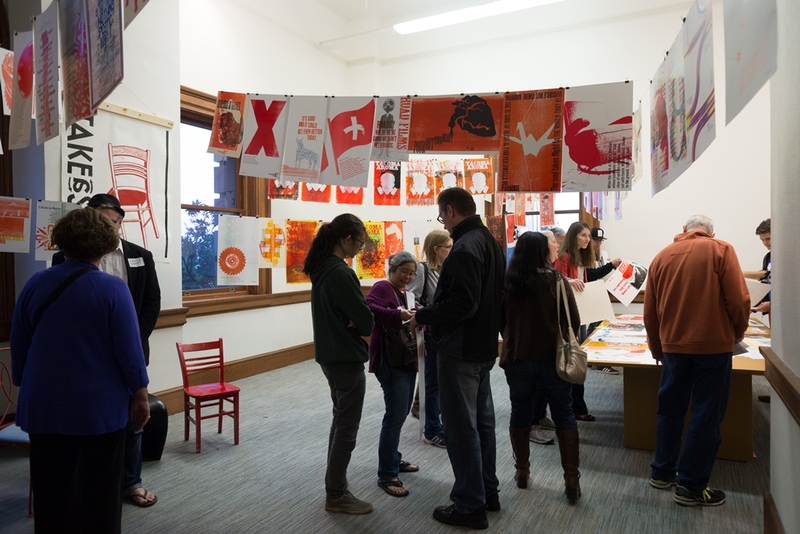 Photos from the 2014 Arts Month Opening Party & AMOCAT Awards at the Tacoma Post Office Building. Presented by the Tacoma Arts Commission and Spaceworks Tacoma, this annual event kicks off Tacoma Arts Month with a big party, art exhibits, performances, and the 2015 AMOCAT Arts Awards. Including appetizers, dessert, and no-host bar, this event is free and open to the public. Pack up the family, invite your friends and come help us celebrate! 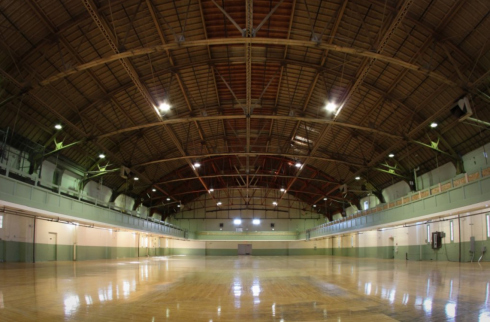 YES… the massive main hall of the Armory will be entirely filled with art exhibits, performances, and activities! 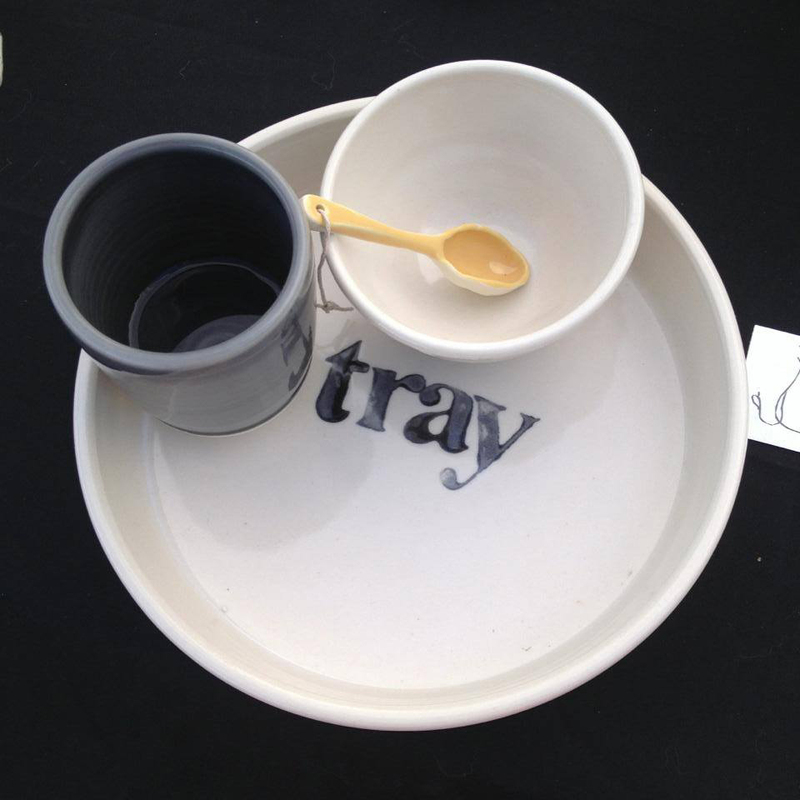 Lucy Nilan is a Tacoma-based potter with a passion for the wheel. Always an animal lover, her current farm-to-table series explores the creatures that live in both our rural and (now) urban farms. 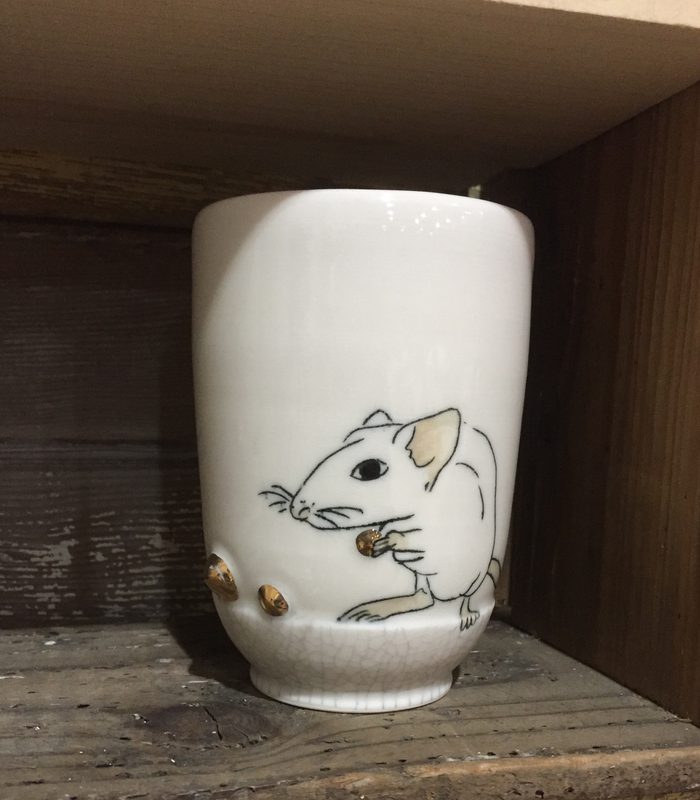 She is exploring the porcelain form with animal portraiture through simple lines, color, and clean illustration. 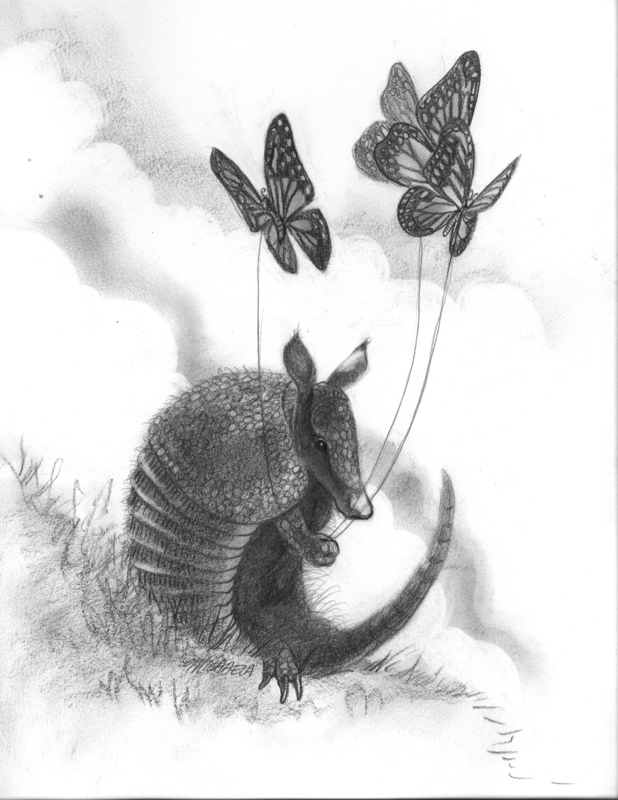 Michaela Eaves bases her fantastical illustration-style artwork on animals and the natural world. Her influences include her upbringing in Montana and the time she spends with her dogs. She finds extra inspiration in mountain biking, music, and impending deadlines. 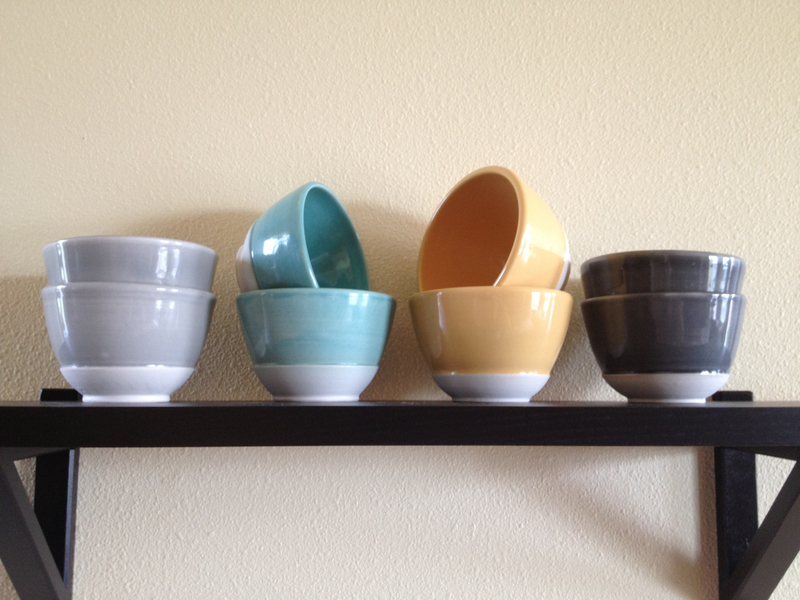 The potters wheel, sculpting, and ‘getting dirty’, became a passion of April Sanders from early on. 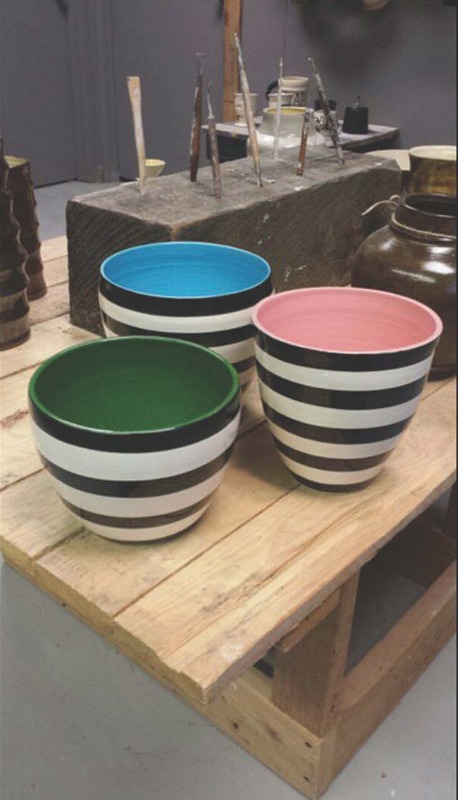 She spent many years studying under local potters in their studios, but she always had a desire to open her own. Along with her longtime friend, Jennifer English, she made her dream a reality in SPUN. April provides her students with hands-on instruction and a fun, easy-going atmosphere. 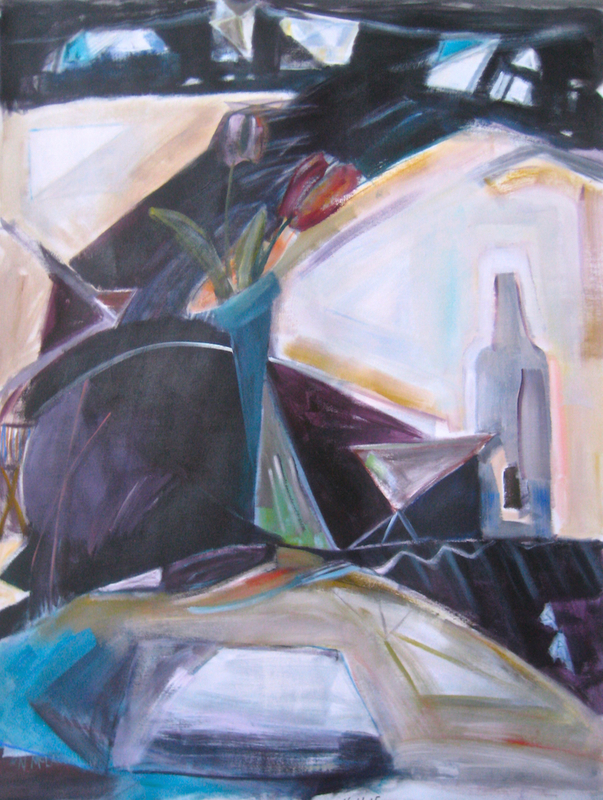 You’ll notice a love of clean lines and vibrant colors in April’s work. 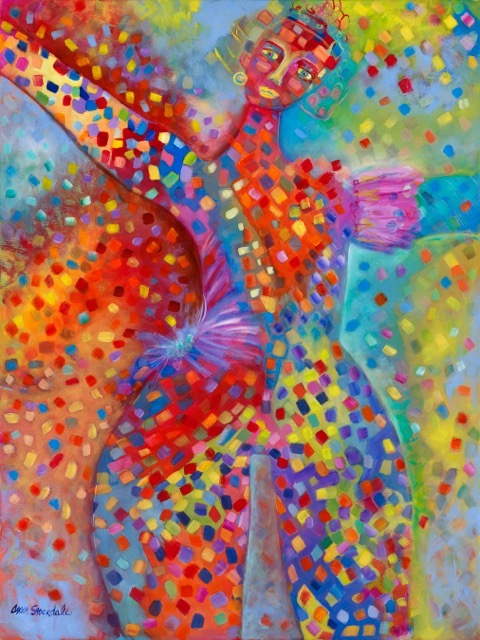 Ann Stockdale “bonds with unseen beneficial forces to let the Universal Energy align her with the joy of her Creator.” She believes in flowing with the Spirit and color. Music and rhythm are her most important elements. 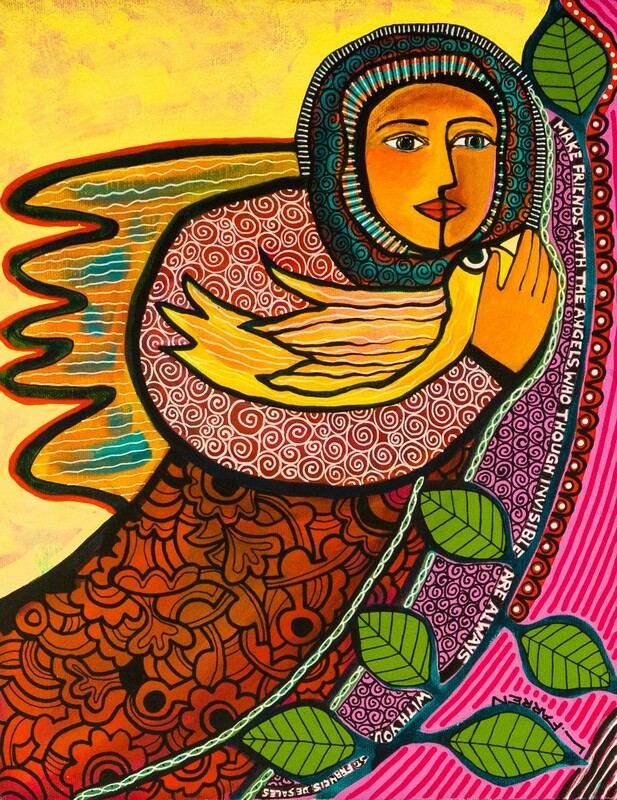 She has had a one woman show at the Frye Art Museum in Seattle and her work has been sold on the Princess Cruise Line and seen in many hotels in Miami, L.A., and Mexico. 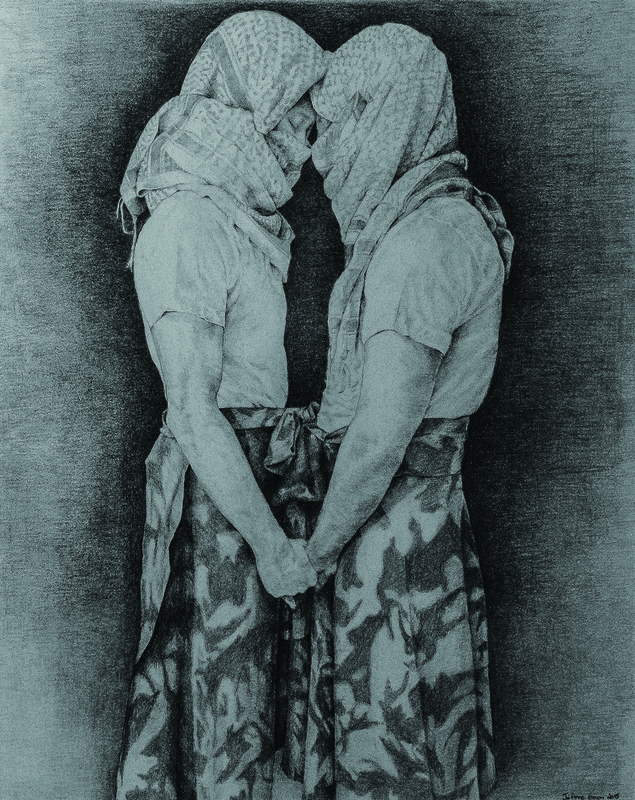 Jo Geron’s work is a series of very large, androgynous, and veiled human figures tenderly and realistically rendered in graphite. 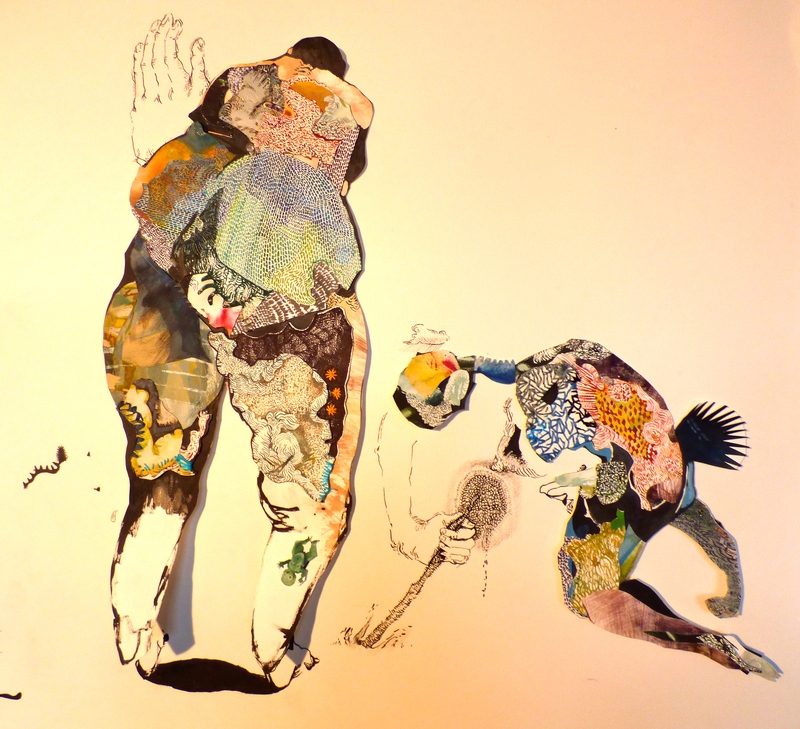 Her work asks questions about gender, relationships, and intimacy. 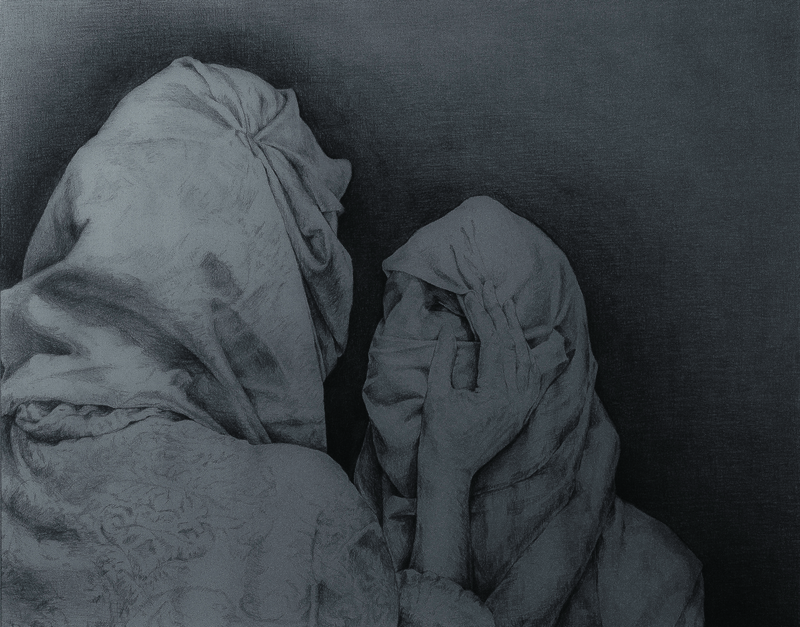 The coverings and figures are a personal reaction to covering and uncovering within relationships and some of her works explore the experience of growing up in Israel. 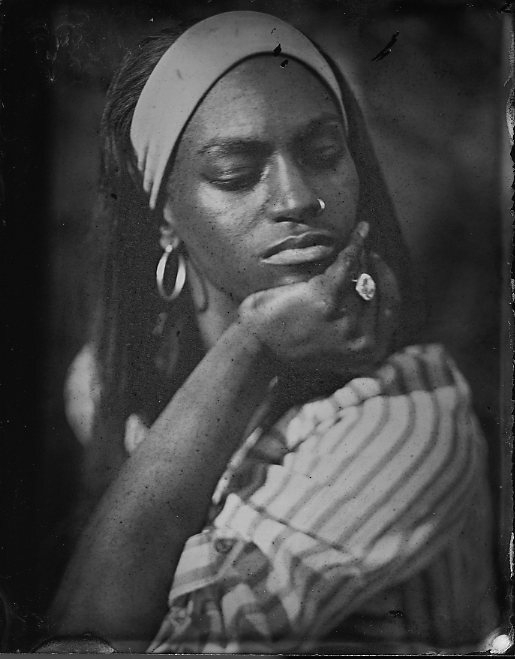 Jo’s work forces the viewer to tolerate discomfort with gender ambiguity and fluidity. 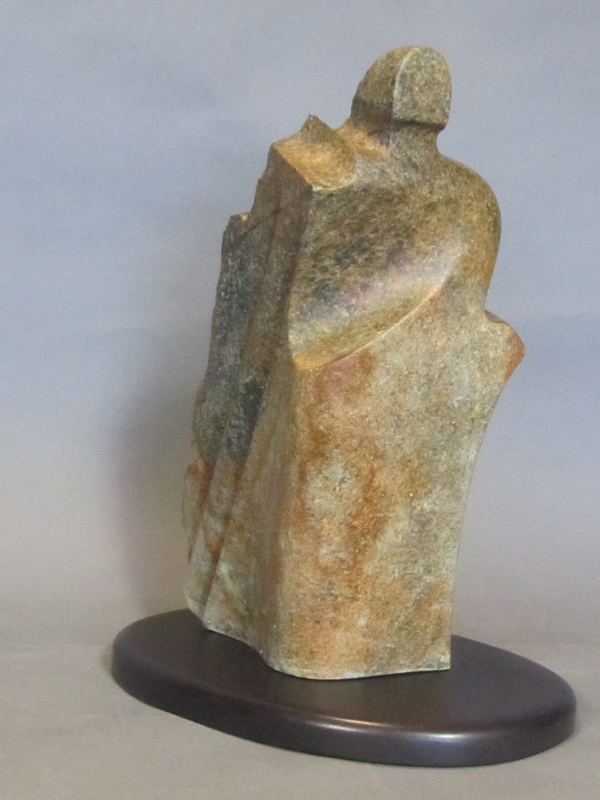 The human figure is what LeeAnn Seaburg Perry most often finds in the stones she carves. 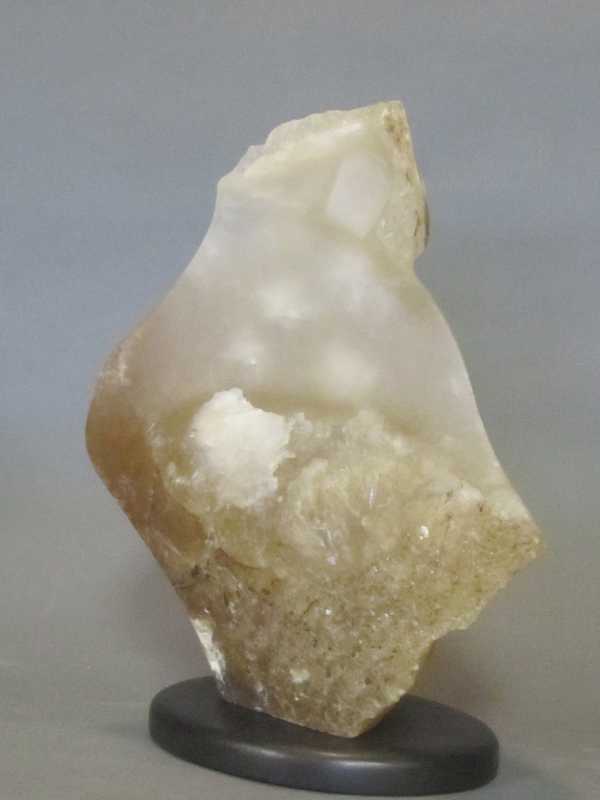 She studies the rock until she sees some part of the stone’s shape that gives a hint at who is inside. Her initial cuts release the head from the stone. With the head identified, the lines of the body emerge. 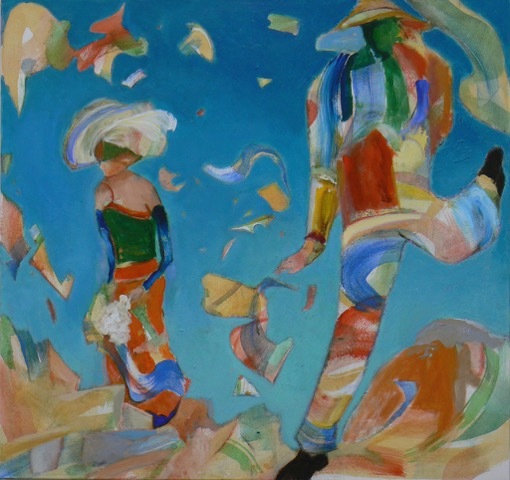 Often, part of the surface remains untouched and occasionally she adds texture to combine with smooth planes and lines to arrive at the strongest possible image. 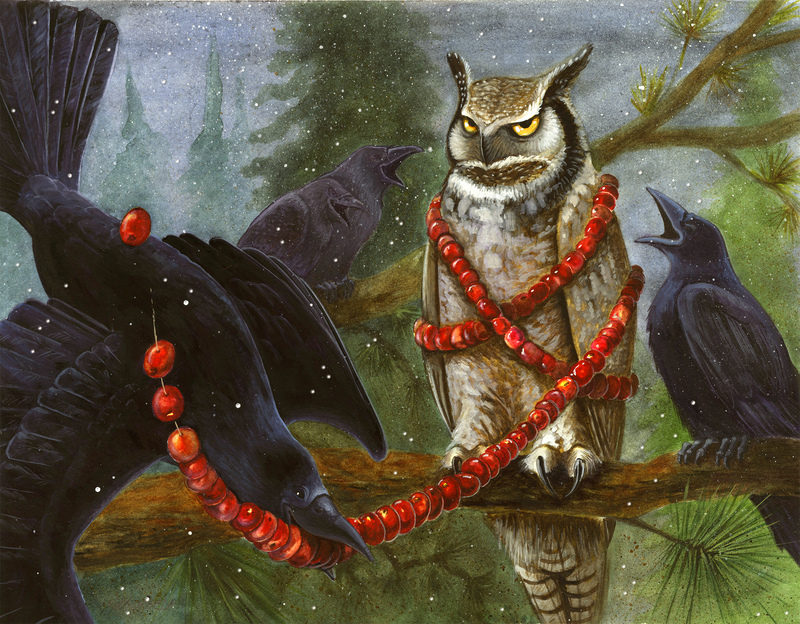 Puget Sound Revels presents Abbots Bromliad. Photo provided by Puget Sound Revels. The City of Tacoma is now accepting Arts Projects funding applications from eligible organizations producing publicly accessible arts programming within Tacoma city limits in 2016. Arts Projects funding ranges from $1,000 to $5,000, and supports community projects that focus on the arts. The application deadline is 5 p.m. on Oct. 30, 2015. 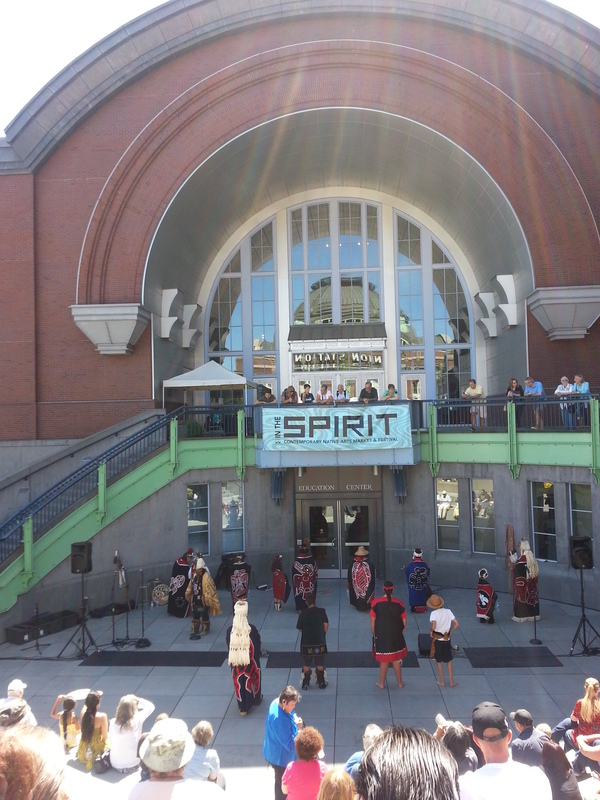 Washington State Historical Society presents In the Spirit: Northwest Native Arts Market and Festival. Photo provided by Washington State Historical Society. Past funding has supported a variety of projects including, but not limited to, arts components of neighborhood festivals; arts workshops or demonstrations; dance, theater, and music performances; youth-focused arts programming; arts-focused cultural and historical events; visual art exhibits; and literary events. Funded events must take place between Jan. 1, 2016 and Dec. 31, 2016. 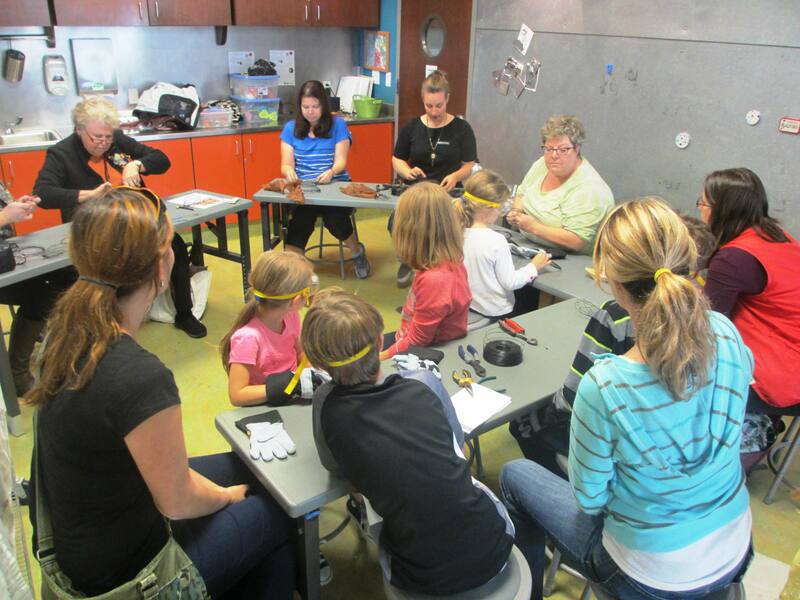 Children’s Museum of Tacoma presents a wire workshop for families. Photo provided by Children’s Museum of Tacoma. Organizations interested in applying for Arts Projects funding can find out about past funded projects and download the guidelines and application form at cityoftacoma.org/funding. Applicants are encouraged to attend a free workshop, which explains and addresses questions about the application and funding process. The workshop will be held Oct. 9, 2015, from noon – 1:30 p.m., in Tacoma Municipal Building North, 728 St. Helens, Room 16. 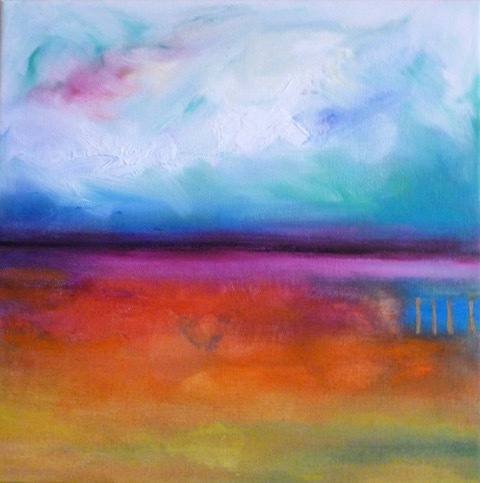 Nancy McLaughlin’s paintings and drawings portray whimsical landscapes sometimes verging on non-objective abstraction. She combines the visible with the imaginary and invisible. She strives to give color and shape to an elemental structure which courses through things that are both tangible and yet to be. Our eyes respond to an infinitely varied visual reality, yet there is so much we can’t readily see, though we are immersed in it. 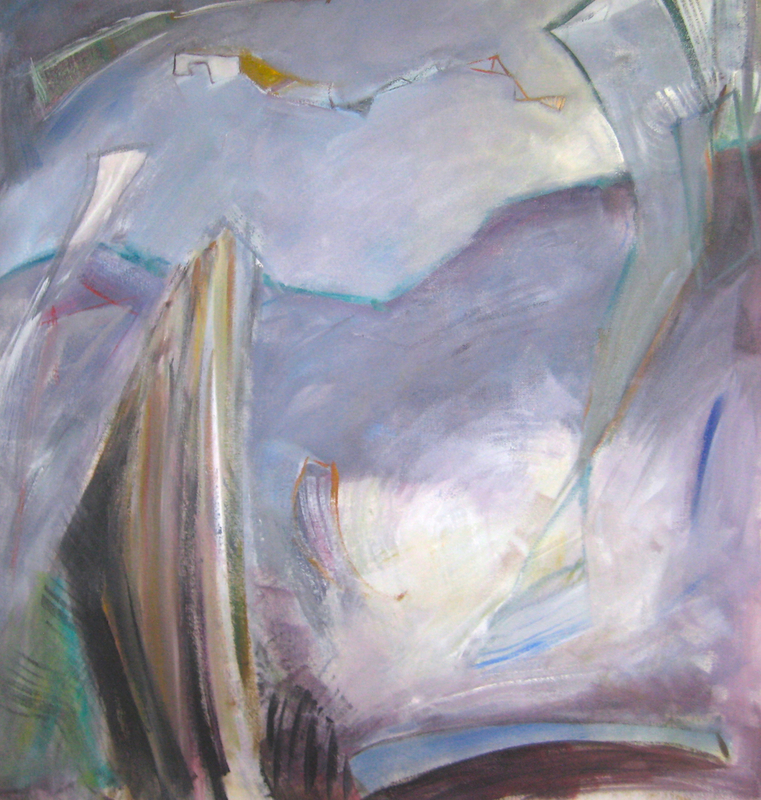 Nancy describes the visible and the unseen as they interact and collide. 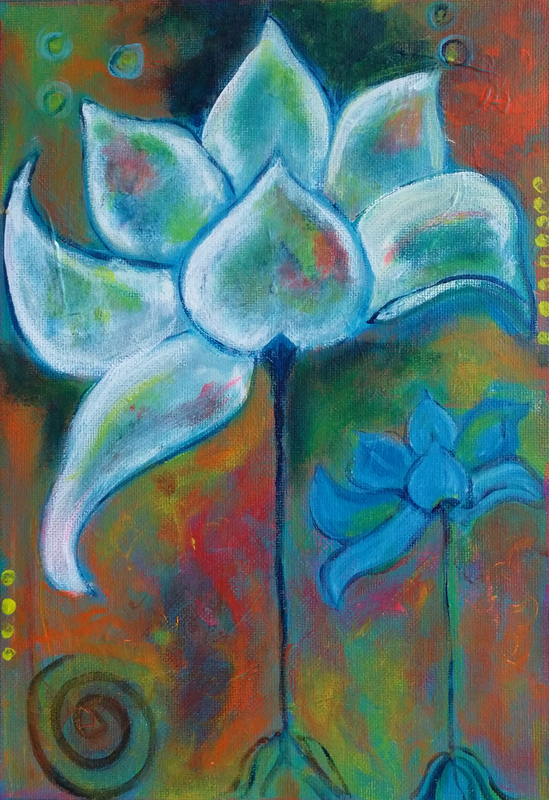 The human body has sustained Pat Haase’s attention and interest throughout her life. She started sewing theater costumes and clothing, then had a 25 year medical career and also taught Yoga. 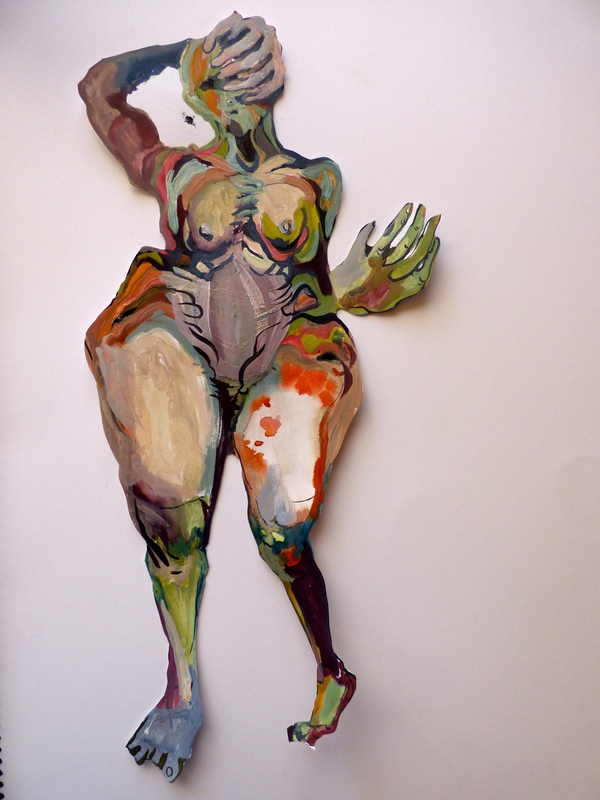 In the past dozen years her attention has turned to creating realistic figurative sculptures, concentrating on nuances of posture to create empathetic awareness. 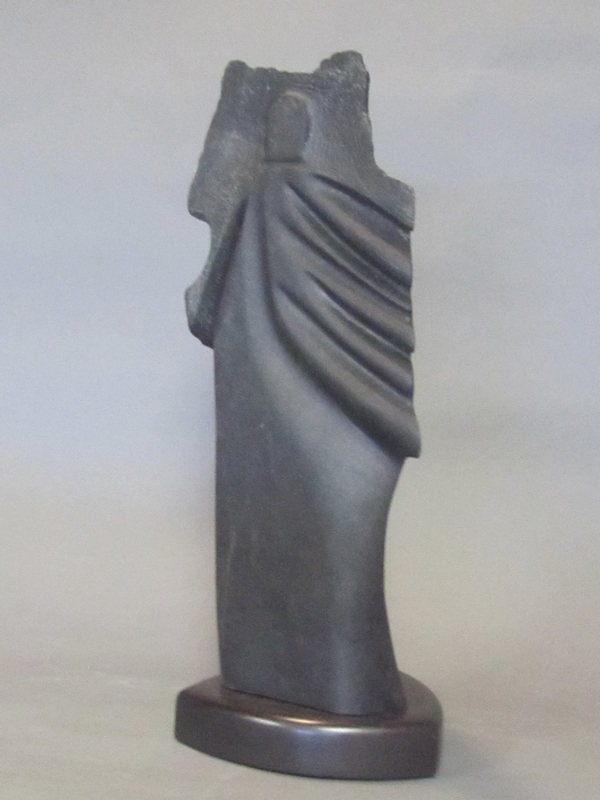 Her sculptures convey personality, attitude, and mood and also suggest a narrative about what just happened, or what may soon happen. Randy Jones’ passion is to put discarded items back to work. 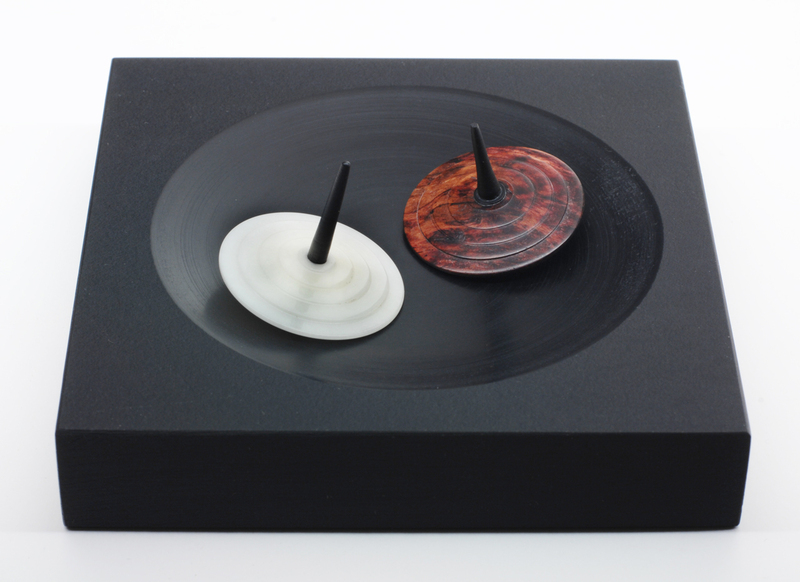 Randy’s sculptures have personality – they are whimsical and playful – belying the precise attention to mass and movement. Such work requires a great inventory of items and about 60% of Randy’s studio is an organized library of found objects. The rest of the space is open to creative construction. Here, Randy arranges objects, tells stories, and draws plans for his next inspiration. 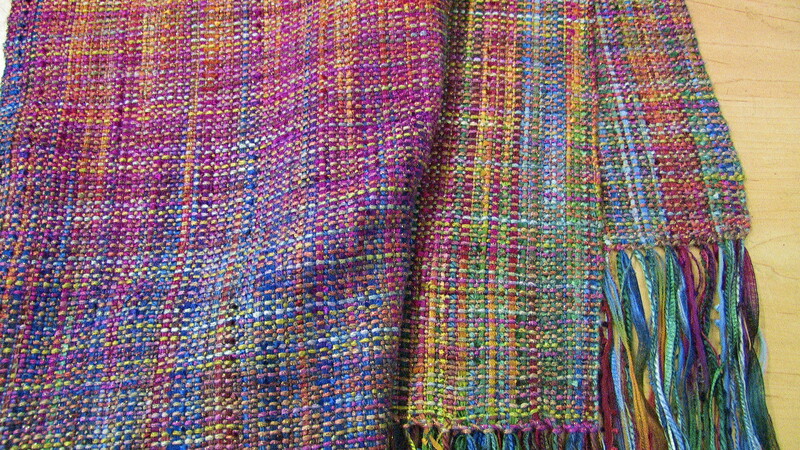 Fibers Etc has been a resource for those interested in textiles, both for handwoven and knit products but also for the knowledge that is shared through classes and workshops. 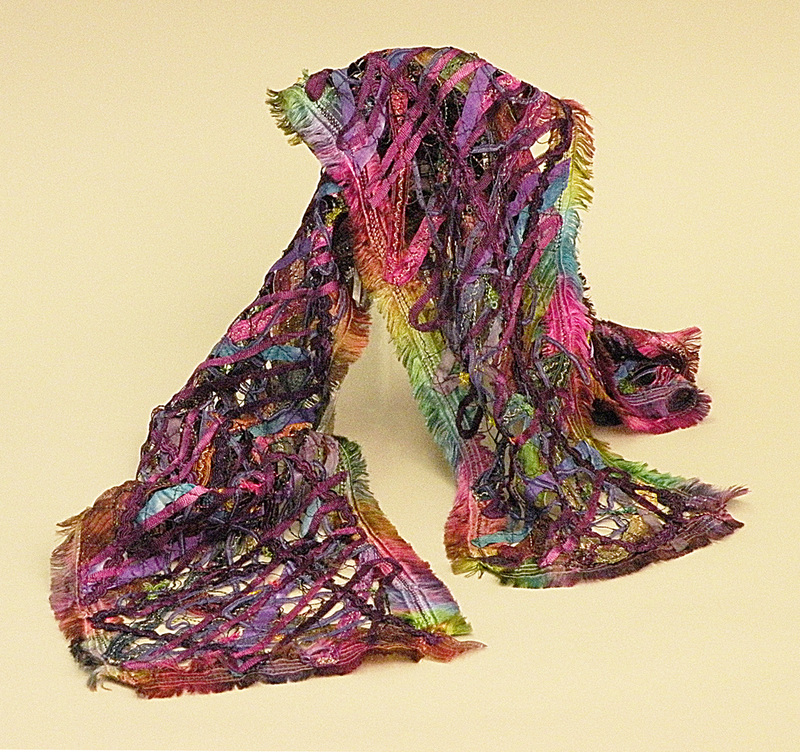 Roberta Lowes creates fashionable hand dyed, hand woven, hand knit, and stitched natural fiber wearables and accessories. 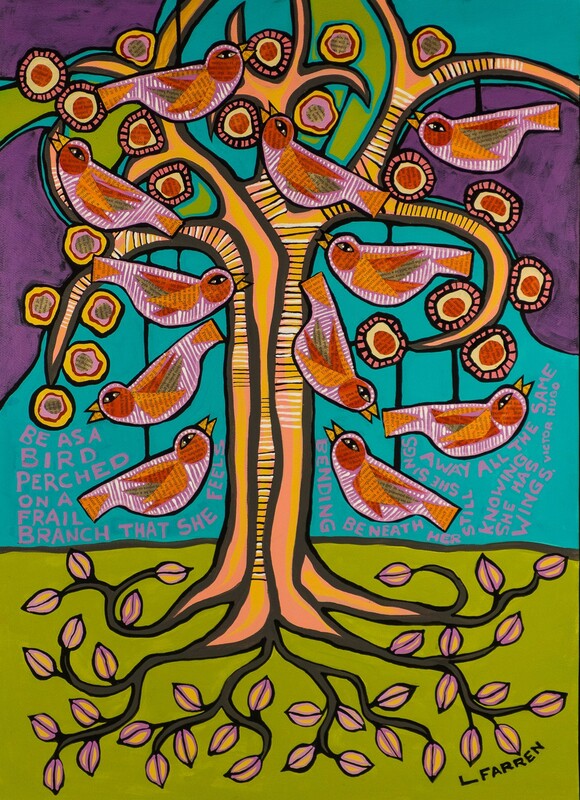 Inspiration comes from the natural world and Roberta’s emphasis is on color and texture. Lucia Harrison grew up on Cooper Point in Olympia, roaming the forests and shores of Puget Sound. Now she is an emeritus faculty from The Evergreen State College. 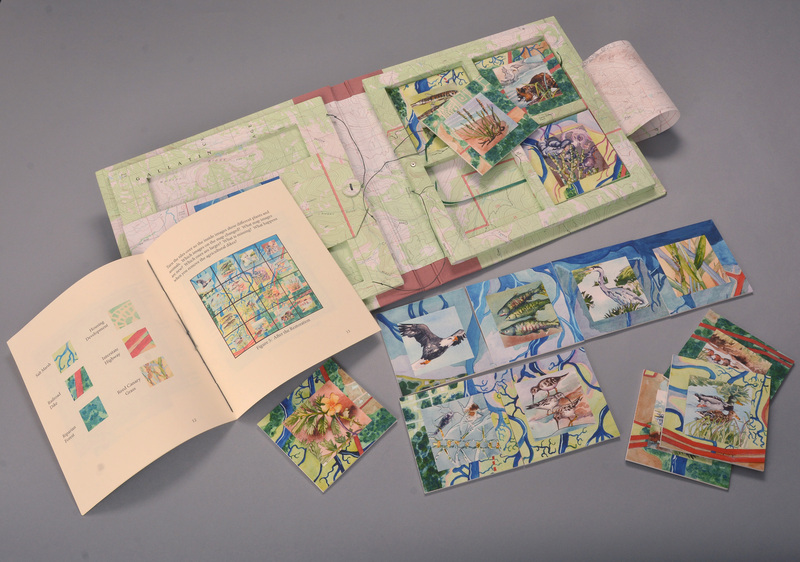 While team-teaching with scientists, she developed the practice of field journaling as inspiration for her paintings, drawings, and artist books. 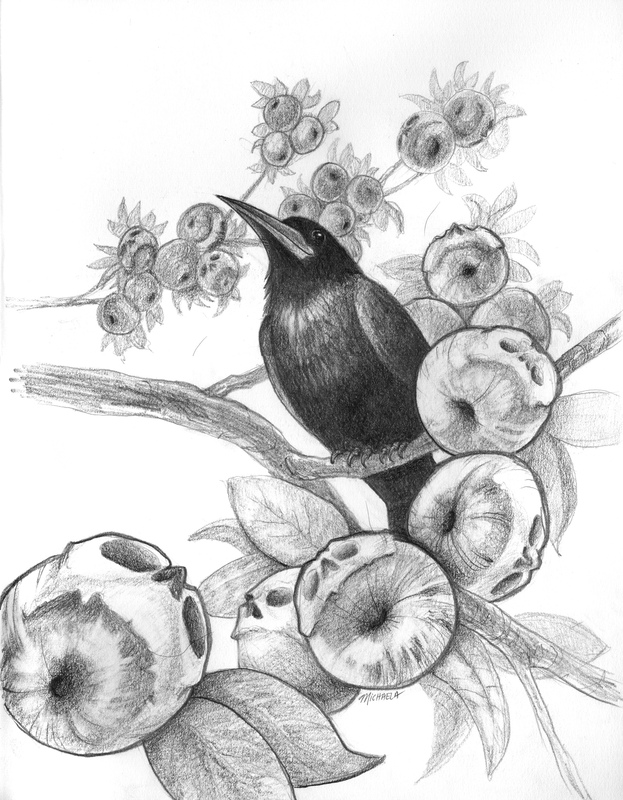 Her works reflect observations of nature and the inspiration she finds there. 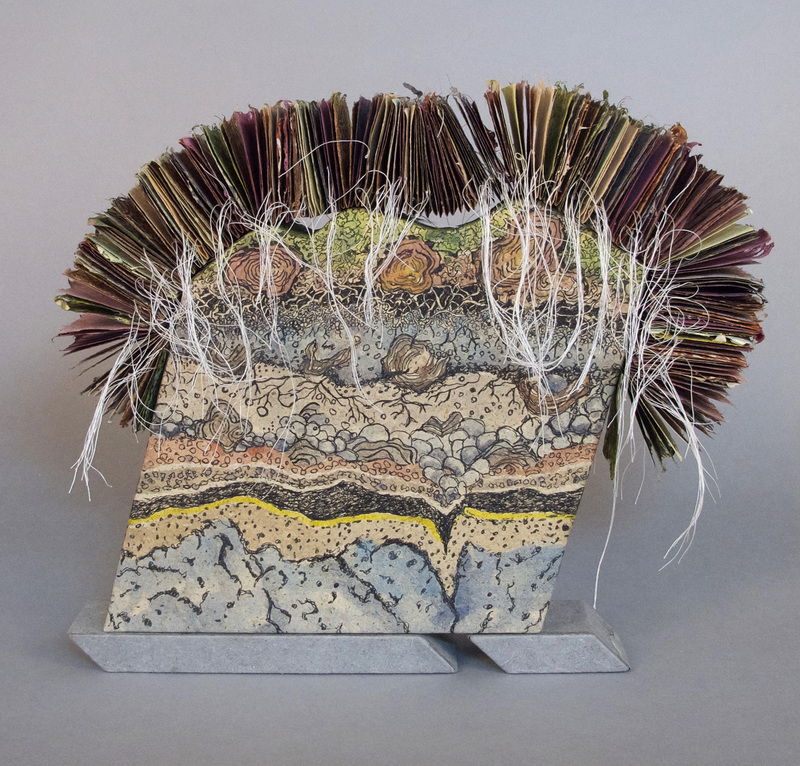 She hopes her artworks inspire viewers to deepen their own interest in the natural and cultural history of South Puget Sound. 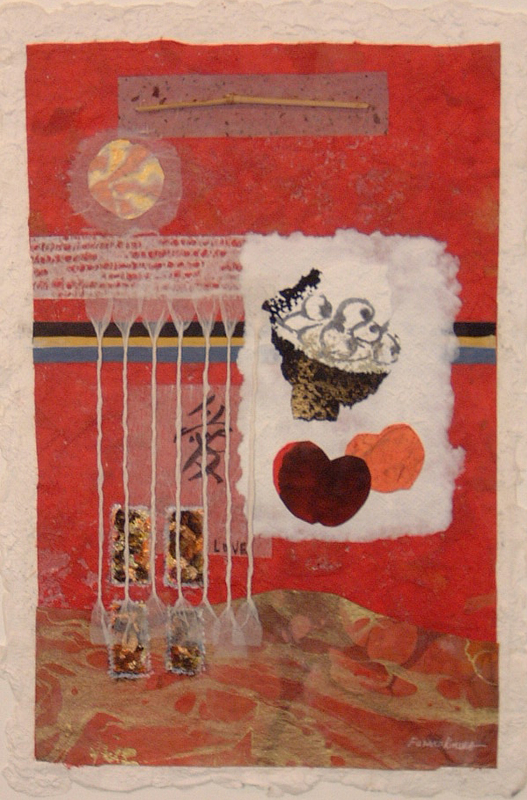 Unusual materials have almost always guided the imagery in Elayne Vogel’s artwork. 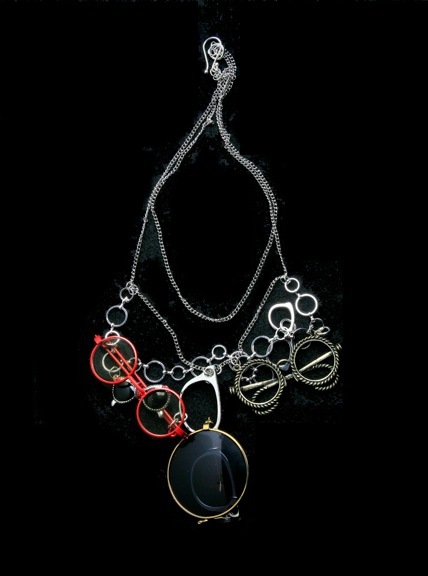 Her one-of-a-kind necklaces are meant to combine humor and fashion in entirely wearable, durable jewelry. 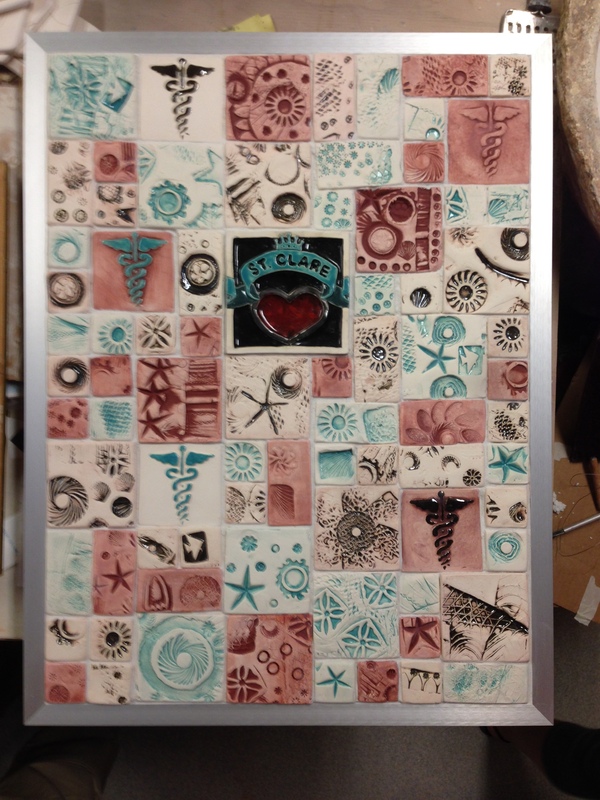 In addition to working in her studio, Elayne enjoys collaborating with artists making art for public sites and events. She received her B.A. degree from the University of Michigan and her Masters of Fine Arts degree from the University of Washington. 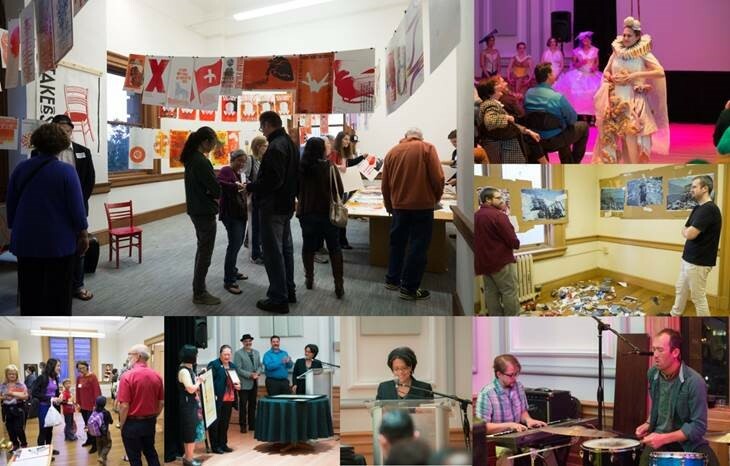 The Tacoma Arts Commission has announced this year’s AMOCAT Arts Award winners: University of Washington Tacoma (Arts Patron), Tacoma Public Library (Community Outreach by an Organization), and Connie K. Walle (Community Outreach by an Individual). 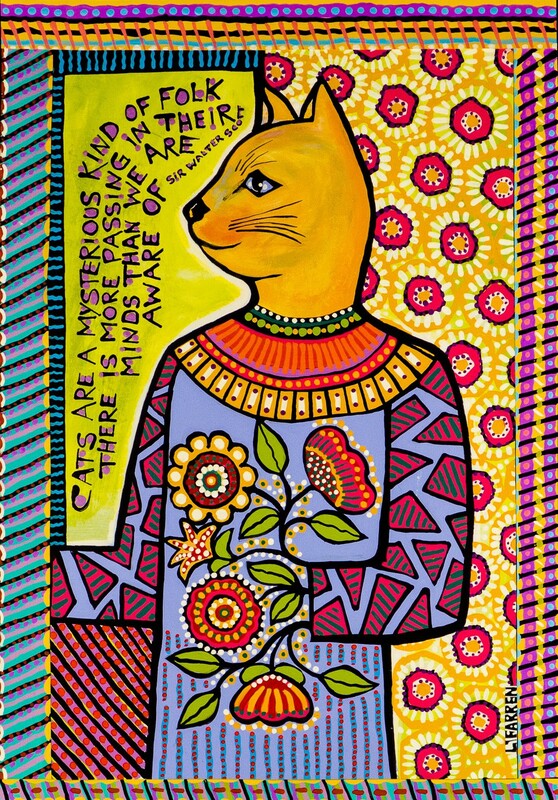 The AMOCAT Arts Awards honor those who provide distinctive contributions to the arts in Tacoma. “Maru” by Gerard Tsutakawa on the University of Washington Tacoma campus. 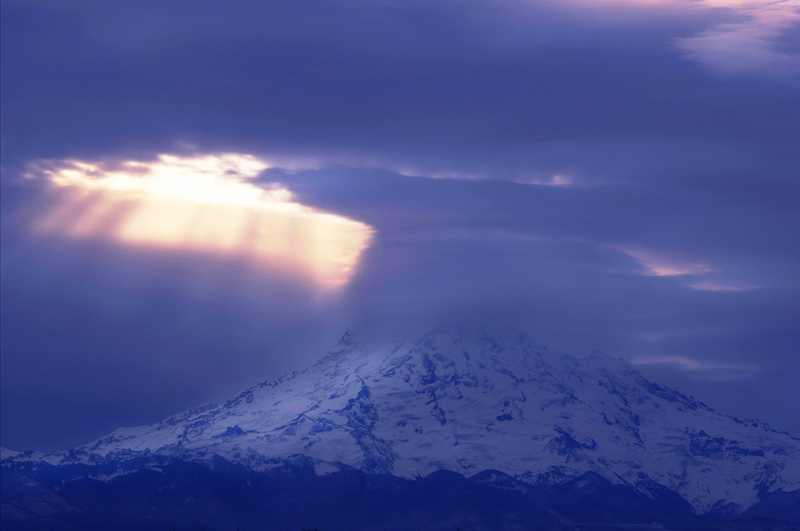 Photos courtesy of UW Tacoma. This award goes to University of Washington Tacoma for its ongoing commitment to serving and partnering with the greater Tacoma community. UW Tacoma’s contributions to the arts in Tacoma began 25 years ago at the campus’ founding, when 15 faculty members were hired to create an interdisciplinary liberal arts curriculum. Since then, the university’s impact on the community can be measured by the work of its faculty, students and alumni; a dense network of partnerships and collaborations; and a growing public art collection. 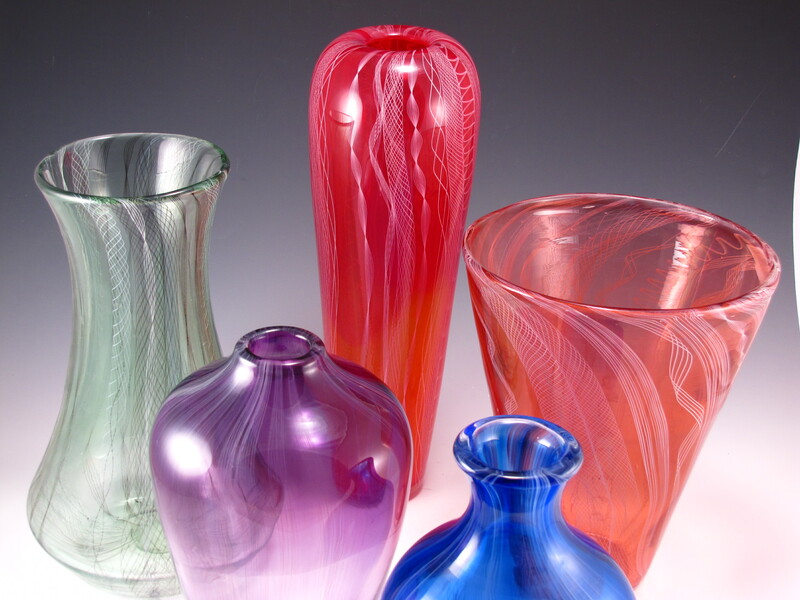 UW Tacoma’s connections to the Tacoma arts community include glass art classes hosted at the Museum of Glass, Tacoma School of the Arts classes held on campus, and a partnership with Spaceworks Tacoma to support creative entrepreneurs. 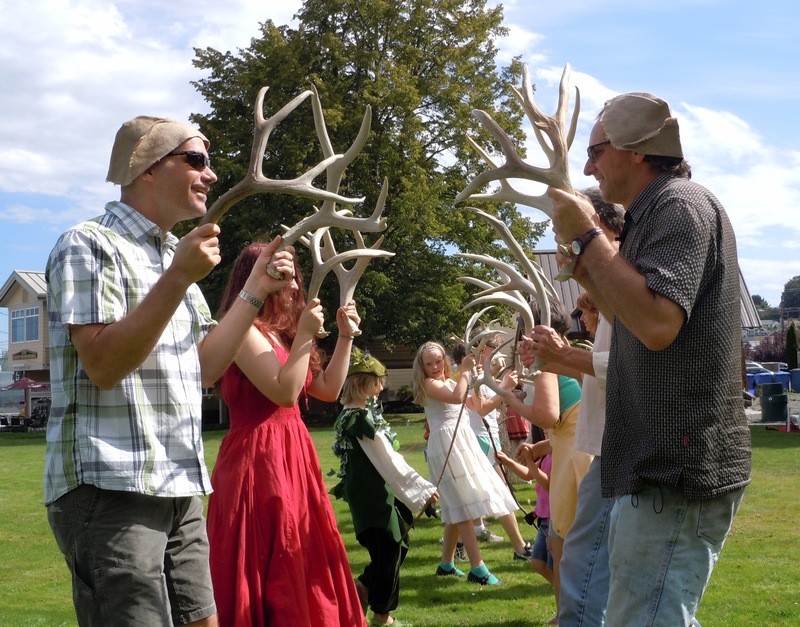 Recent collaborations include an innovative community-based theater production by UW Tacoma faculty and Toy Boat Theatre, and the hosting of a portion of the City of Tacoma and Tacoma Art Museum’s Pop-Up Art Putt! golf course. 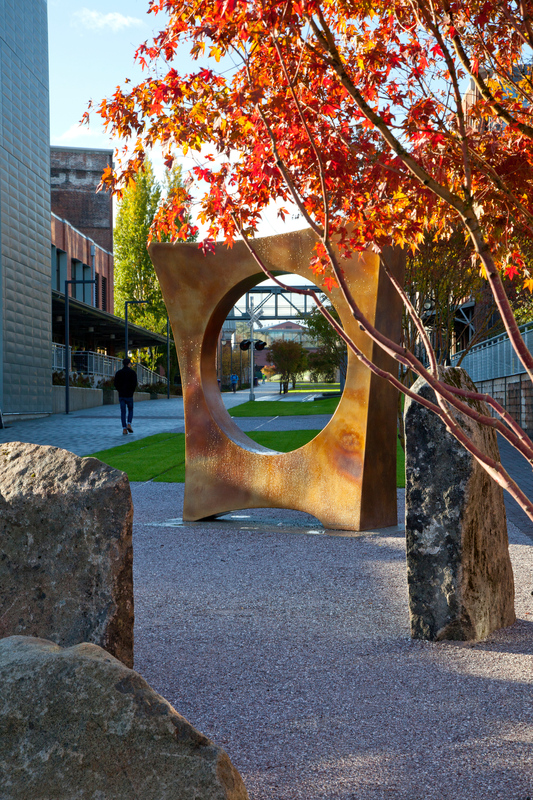 UW Tacoma’s investment in developing the campus and Prairie Line Trail, with a commitment to aesthetic design and adaptive re-use, has encouraged a more walkable and beautiful community. 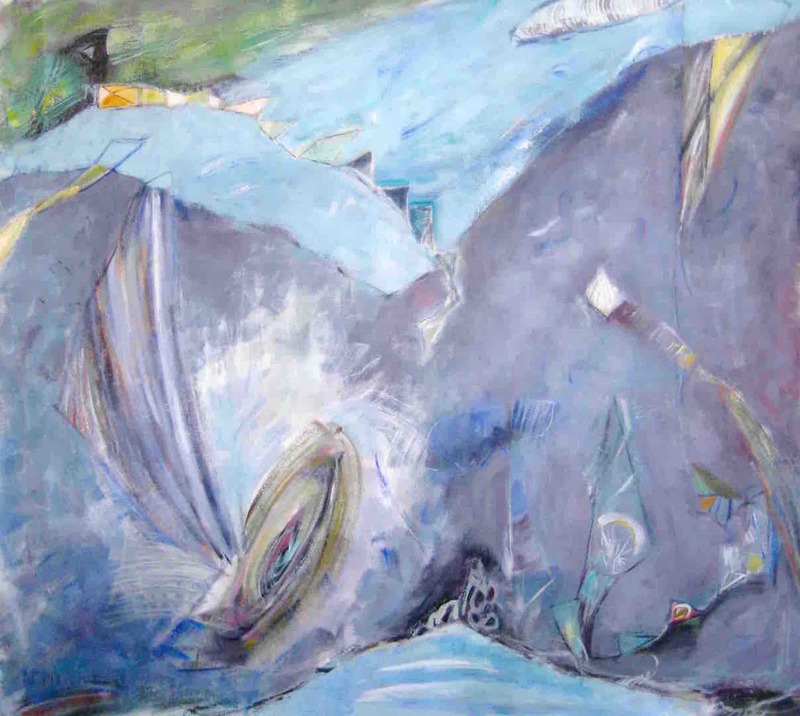 The campus proudly displays a diverse art collection including works by Pablo Picasso, Dale Chihuly, Gerard Tsutakawa, Dawoud Bey, Buster Simpson and many others. 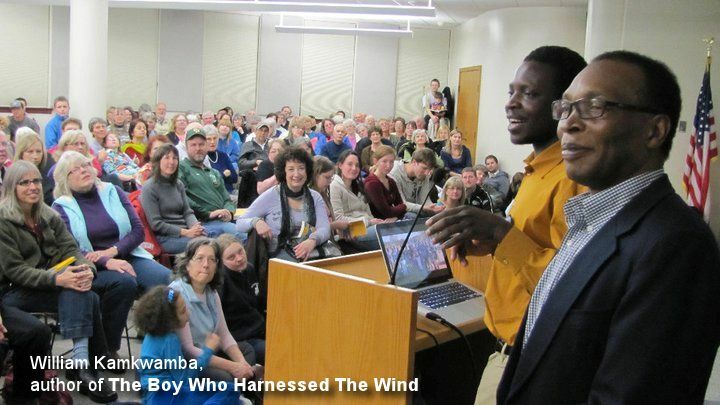 William Kamkwamba, author of The Boy Who Harnessed The Wind, at Tacoma Public Library. Photo courtesy of TPL. This award goes to Tacoma Public Library for its deep and ongoing commitment to creating opportunities for interactive and dynamic lifelong learning through the lens of arts and culture. Tacoma’s public libraries are hubs of community activity where citizens can gather together to tell and create stories, listen to and create music, experience art, play chess, access the internet, and escape with a great film. The libraries bring readers and writers together to share a love of stories through book talks and signings, discussion groups, and the community-wide reading program: Tacoma Reads Together. The Handforth Gallery at the Main Library provides an opportunity to experience visual art created by local, regional, national and international artists, as well as to hear artists talk about their work and learn more about the art forms through demonstrations. The Tacoma Public Library provides free performing arts opportunities for the public including music concerts, puppet shows, magic acts, silent movies, jugglers, clowns, and acrobats. The Main Library’s StoryLab encourages students to expand their digital creativity through workshops in sound production, voice-over, film production and editing, beat-making, digital drawing, and song writing. 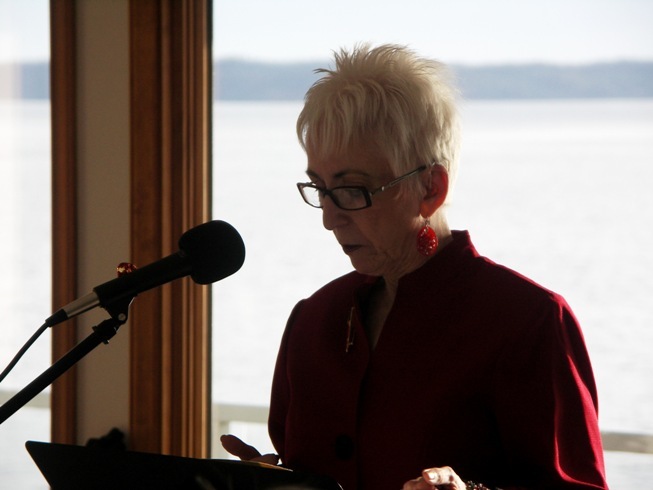 Connie K. Walle reads from her poetry. This award goes to Connie K. Walle for her commitment to elevating the literary arts in Tacoma and the South Sound. Walle is a poet, the founder and president of Puget Sound Poetry Connection (PSPC), and facilitator for the Distinguished Writer Series, which has been a staple of Tacoma’s literary arts community for 25 years and counting. The Distinguished Writer Series provides a platform where poets of national regard share their work with the South Sound community, and where local writers of all levels and backgrounds can share their work in a constructive and supportive environment. Under Walle’s leadership, PSPC has spearheaded multiple projects including literary publications, a teen writing contest and poetry workshops. She also hosts poetry critiques and produces a weekly e-newsletter promoting poetry-related opportunities throughout the region. PSPC, along with collaborating partners, are producing the first ever Tacoma Poetry Festival on October 16 and 17, 2015. The Distinguished Writer Series meets at 7 p.m. on the second Friday of every month at King’s Bookstore (218 St. Helens Ave., Tacoma). The event is free and open to the public. All ages and levels of writing are welcome. Awardees will be honored at the annual Tacoma Arts Month Opening Party on Oct. 1, from 6 – 9 p.m., at the historic Tacoma Armory (715 S. 11th St.). Mayor Marilyn Strickland will present the awards starting at 7:45 p.m. In addition, there will be live entertainment at this event that includes music by Ken Jacobsen, contemporary dance by the BareFoot Collective, Samoan Village Dance by Asia Pacific Cultural Center, poetry by Tacoma Poet Laureate Cathy Nguyen, and more. Attendees can also explore a series of pop-up multimedia art exhibits by Christopher Jordan, Isaac Olsen, Jennifer Chushcoff, Nichole Rathburn, Janet Marcavage, Tim + April Norris, Terese Cuff, Elizabeth Gahan, Diana Leigh Surma and Judd Cohen. The event will include appetizers, dessert and a no-host bar. This free public event is presented by the Tacoma Arts Commission and Spaceworks Tacoma with support from the Historic Tacoma Armory and is sponsored by Click! Cable TV, The Greater Tacoma Community Foundation, Tacoma Weekly, Northwest Public Radio, KPLU, Weekly Volcano, South Sound magazine, and ARCADE. 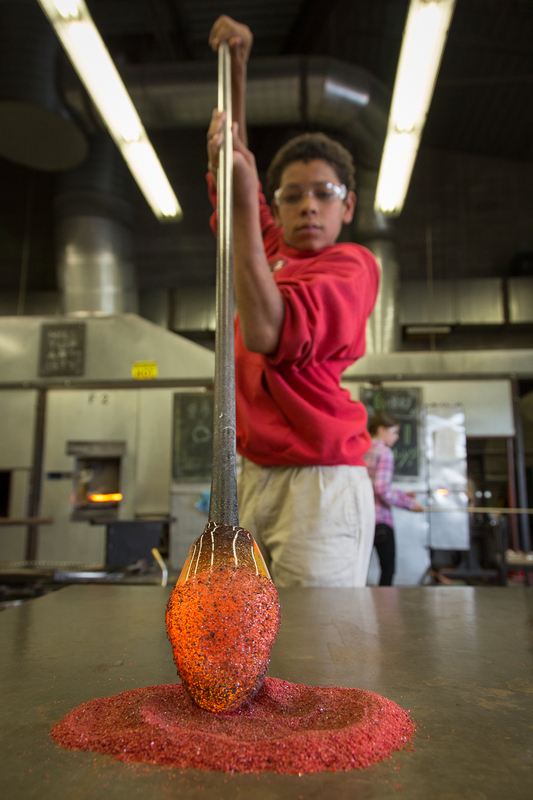 October 2015 marks the 14th anniversary of Tacoma Arts Month – a community celebration of the arts that includes hundreds of community-hosted arts and culture events, exhibits, and workshops for all ages taking place every day throughout the month. Programming includes music, theater and dance performances; visual art exhibits; film screenings; literary readings; lectures; cultural events; and workshops. All events are open to the public and many activities are free. 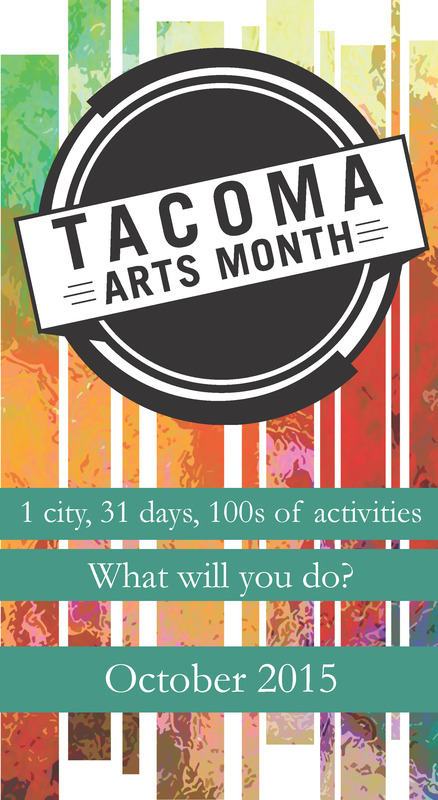 Information about the 300+ Tacoma Arts Month events, workshops, and exhibits can be found online at TacomaArtsMonth.com. Attendees of Tacoma Arts Month events are invited to participate in the Tacoma Arts Month Challenge! Throughout October, those who attend Tacoma Arts Month events and post a photo to social media using #TacomaArts will be entered to win one of three prizes. Tacoma Arts Month attendees may also enter by completing and mailing the submission form found in the back of the Tacoma Arts Month brochure. Grand prize, second, and third place winners will be announced in November. For more information about the Tacoma Arts Month Challenge, visit TacomaArtsMonth.com. Historic Tacoma Armory, 715 S. 11th St.
Join us for this free community celebration. Live entertainment includes music by Ken Jacobsen, contemporary dance by the BareFoot Collective, Samoan Village Dance by Asia Pacific Cultural Center, poetry by Tacoma Poet Laureate Cathy Nguyen, and more. 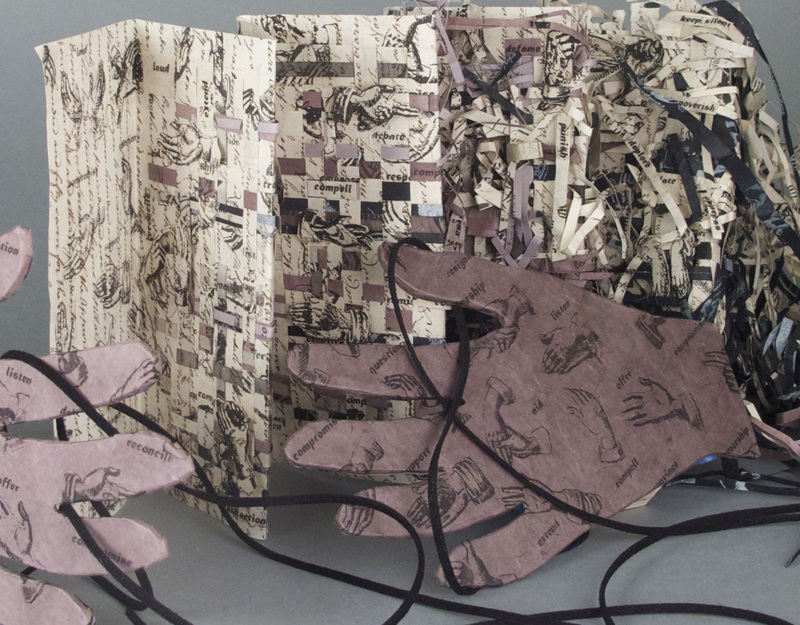 The historic building will host a series of pop-up multi-media art exhibits by Christopher Jordan, Isaac Olsen, Jennifer Chushcoff, Nichole Rathburn, Janet Marcavage, Tim + April Norris, Terese Cuff, Elizabeth Gahan, Diana Leigh Surma and Judd Cohen. There will be appetizers, dessert and a no-host bar. The event will include recognition of the Tacoma Arts Commission’s 2015 funding recipients and the AMOCAT Arts Award winners – University of Washington Tacoma, Tacoma Public Library, and Connie K Walle. The event is presented by the Tacoma Arts Commission and Spaceworks Tacoma with support from the Historic Tacoma Armory. Come see the spaces and tools with which 57 local artists create their work. 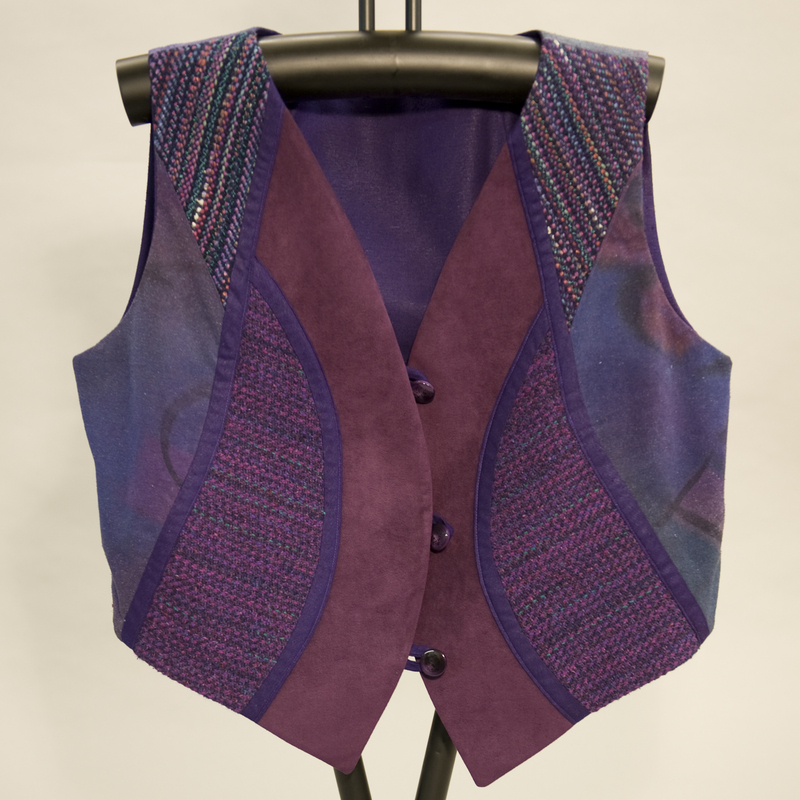 You can ask questions and purchase one-of-a-kind creations. This free, self-guided tour runs Oct. 17 and Oct. 18 from 11 a.m. – 5 p.m., and covers 35 locations around Tacoma. 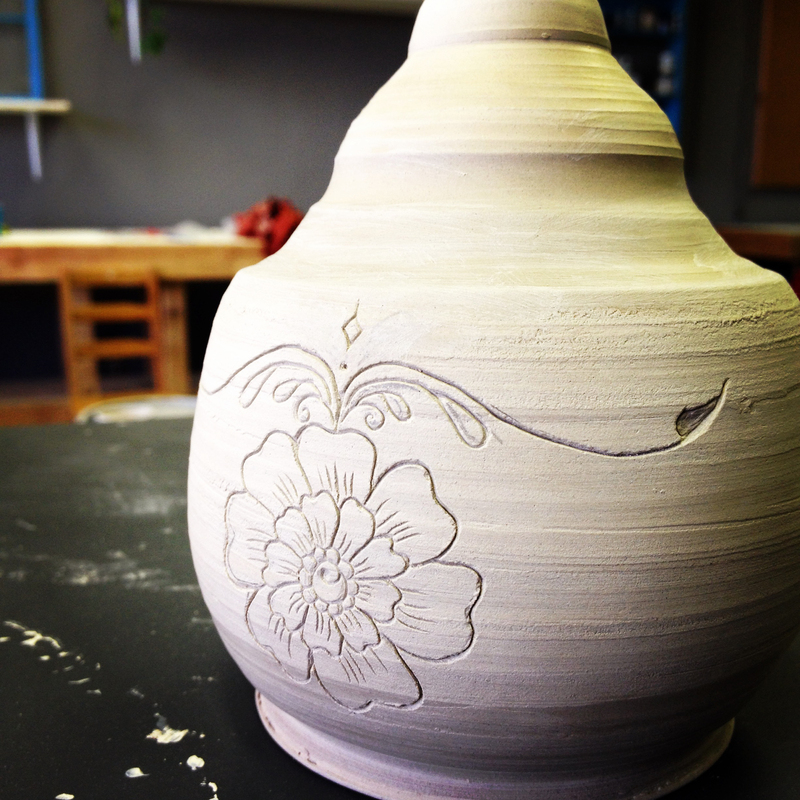 All studios will feature demonstrations of the artistic process or will have hands-on activities for visitors. Studio Tour attendees are encouraged to pick up a Tacoma Studio Tour Passport and have it stamped at each studio location visited. Once at least 8 stamps have been collected, the passport can be submitted for a chance to win one of several prize packages containing artwork hand-crafted by a selection of artists on the tour. Visit the Tacoma Studio Tour website for a complete list of studio locations, an interactive Google map, and information about the Tacoma Studio Tour Passport. Tacoma Arts Month is sponsored by Click! Cable TV, The Greater Tacoma Community Foundation, Tacoma Weekly, Northwest Public Radio, KPLU, Weekly Volcano, South Sound magazine, and ARCADE. This is part 4 in our series highlighting the artists participating in the Tacoma Studio Tour this October. 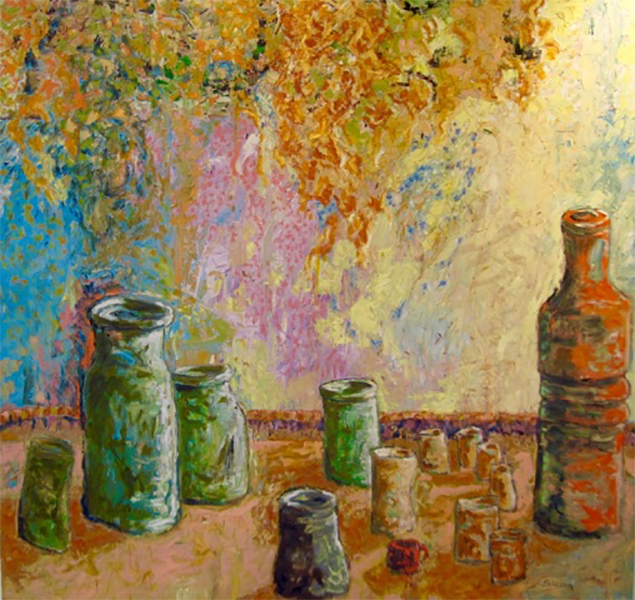 Art making fills the inside of Lynne Farren’s studio. 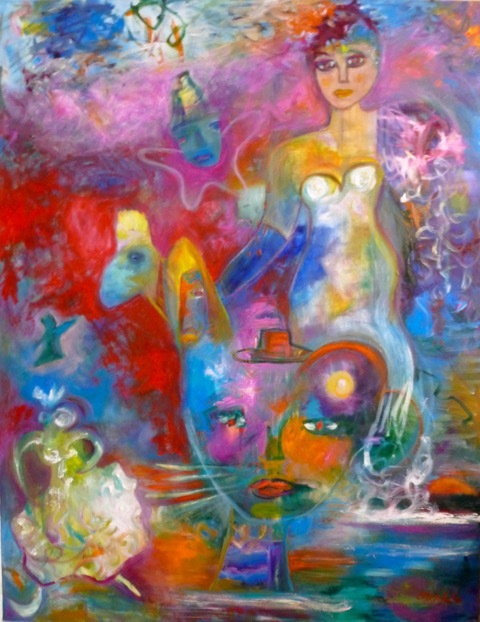 Step inside to see paintings, assemblages, collages and totem dolls. Art work will be spilling out into the hallway too. 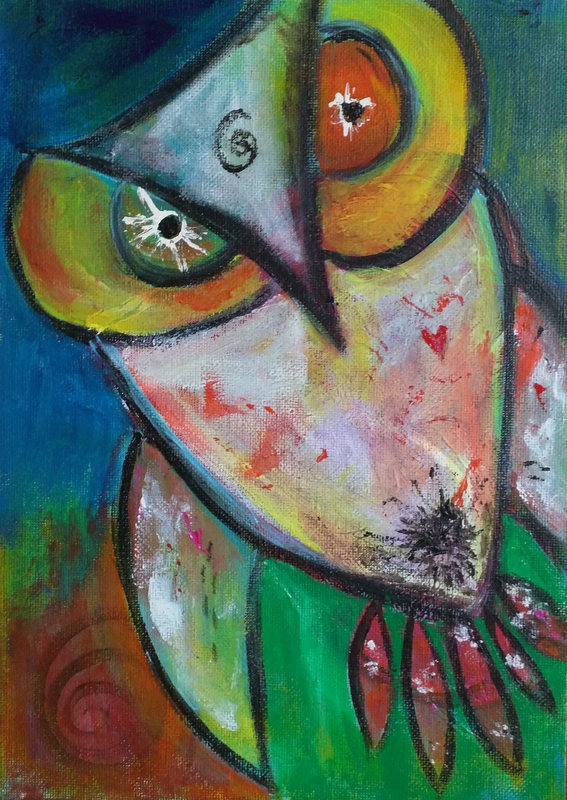 Nadine Hamil works with acrylic paints and is a master expressive arts and intuitive painting facilitator. 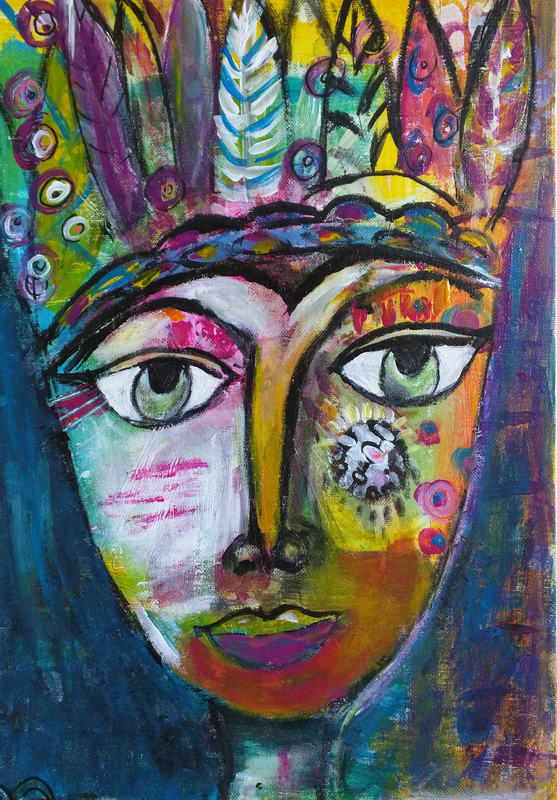 She runs Artful Dreamers Studio, an ideal place for people to enhance creativity, find new inspiration, explore their spirit, and play with vibrant colors. Through workshops, Nadine helps guide her students to discover the magic of their spontaneity and the power of their intuition. She is a Creatively Fit creativity coach. 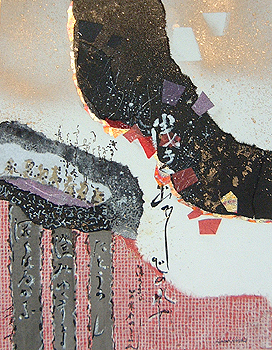 Fumiko Kimura earned a Masters in Art Education from the University of Puget Sound in 1977 and continues to volunteer-teach, paint, and exhibit. 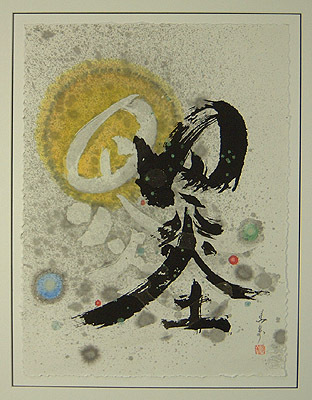 Her main medium is Asian sumi brush painting and calligraphy, traditional watercolors and mixed media collages, abstracts, and absolute art. 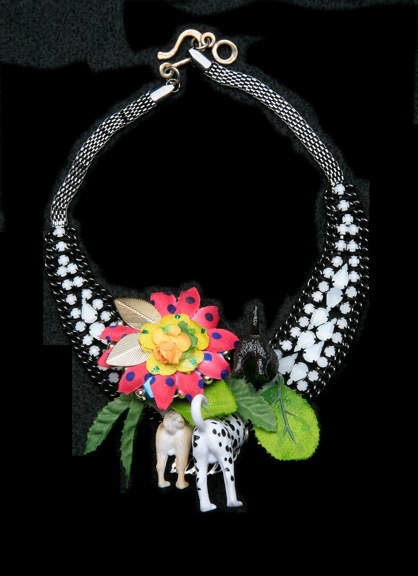 Her innovative and experimental works are inspired by nature motifs using various materials. Kyle Dillehay has been fascinated by photography but, with the introduction of the digital camera, it became too predictable for him. 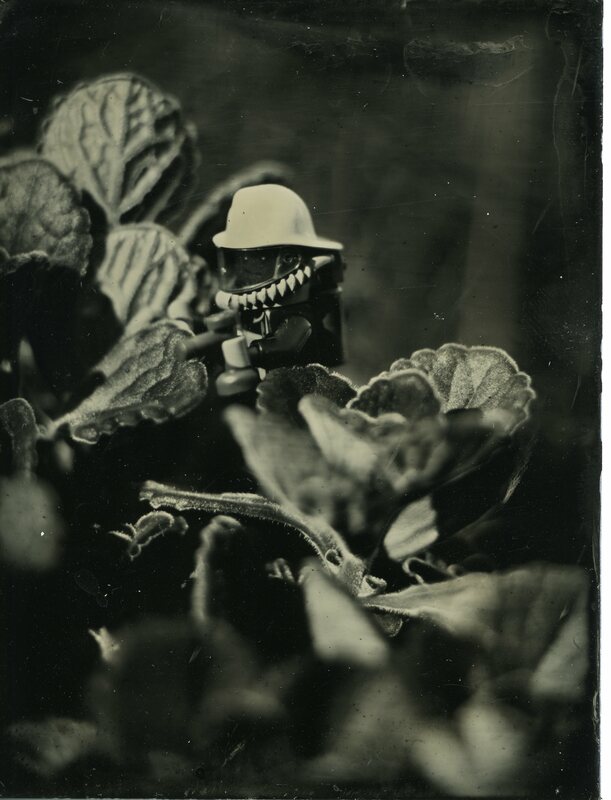 He turned his focus on the roots of analog photography, not just by recording the image itself, but by being an active participant in the entire photographic process. This brought Kyle back to the photo processes of the mid-19th century, using “simple” chemicals to create highly detailed photographic plates. 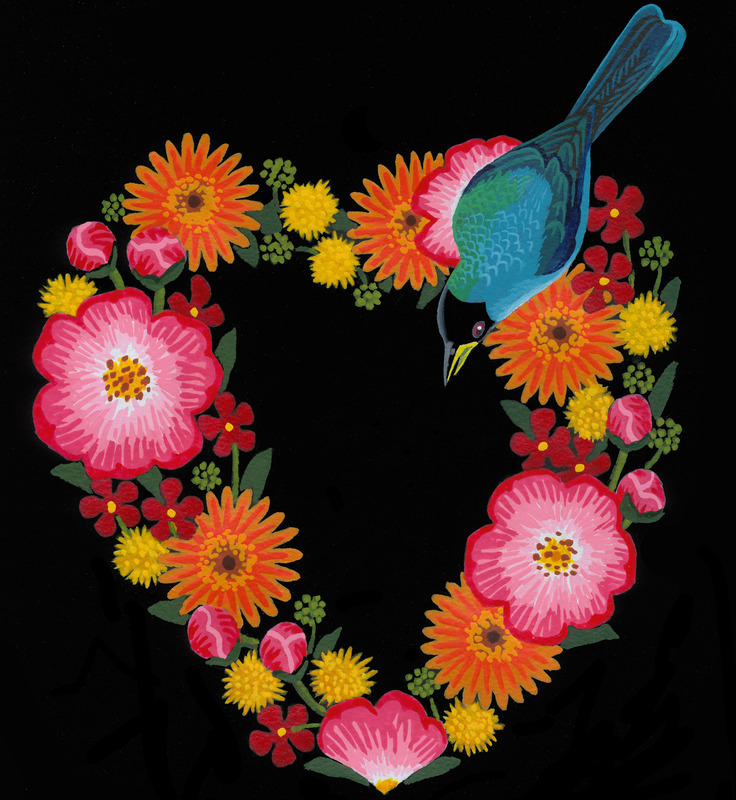 Chandler O’Leary is a graduate of the Rhode Island School of Design, and the proprietor of Anagram Press-a small business specializing in lettering and illustration. Chandler is the author/artist of the illustrated travel blog, “Drawn the Road Again,” and one half of the collaborative team behind the “Dead Feminists” poster series. She has lived and worked in Tacoma for seven years. 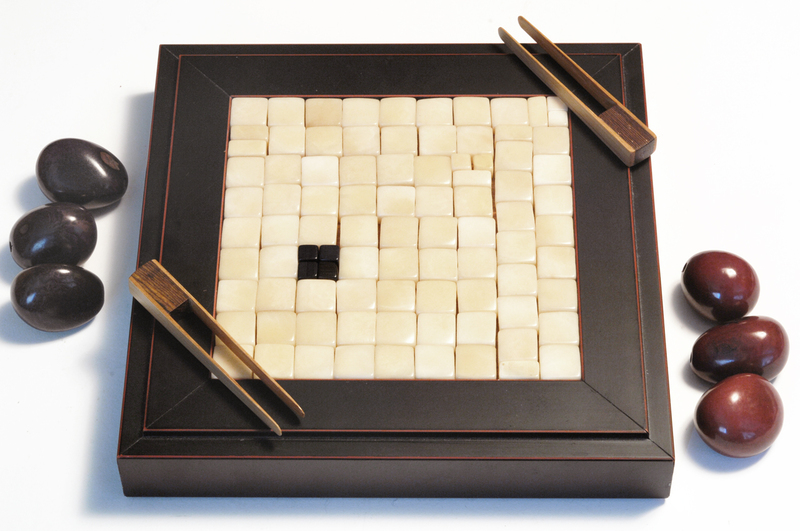 Henry Haneda has, for decades, received international awards and invitationals for his art and craft works. 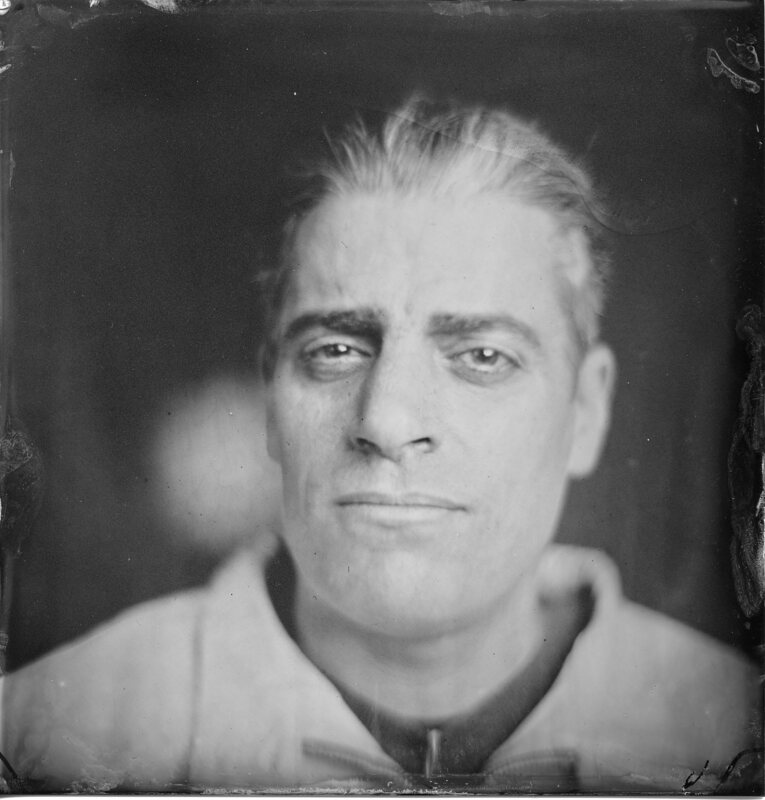 Henry uses medium and large format films, which convey detailed impressions to large prints. He has also been a world-renowned rod and knife maker since 1980, using metal, graphite fiber, wood, and recycled paper composites, which convey detailed craftsmanship to the highest quality products. 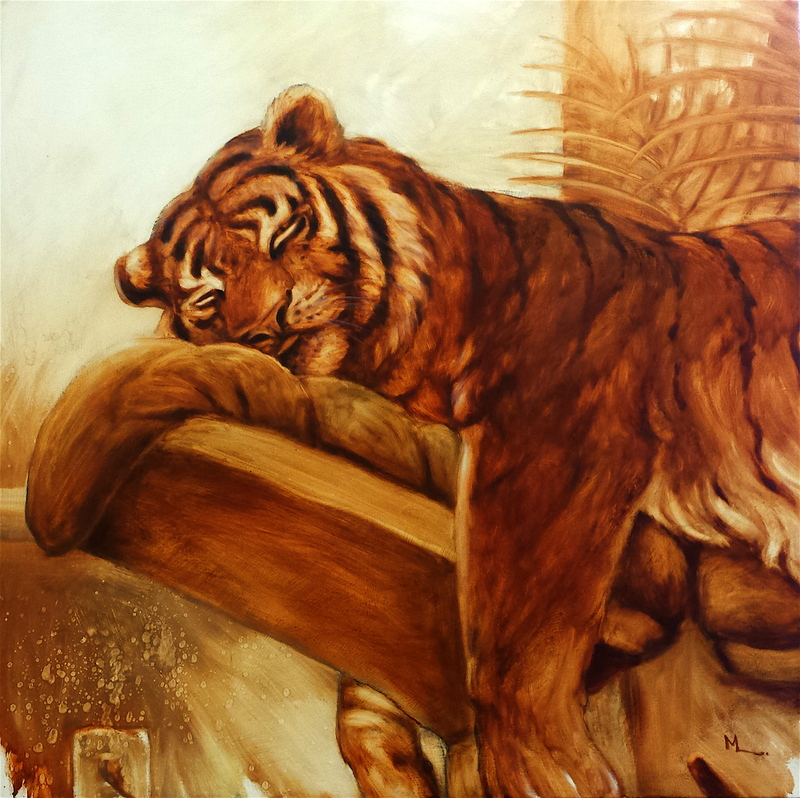 Visit the machine shop studio on Saturday to see his processing. Visit his studio on Sunday to see his photography. 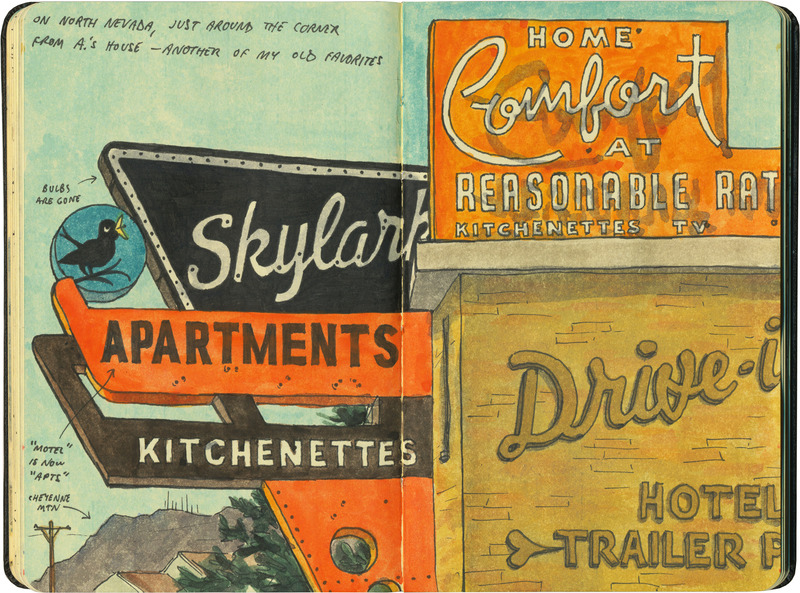 Largely self-taught, except for drawing instruction at the Seattle Academy of Realist Art, K.C. Bacon works almost exclusively with oil on board. 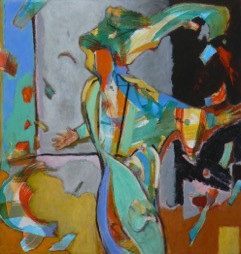 His range of subjects include landscape and portraiture, emphasizing Expressionism. The studio is well-lit and spacious, with a wood stove to ensure winter comfort. A separate gallery features an open beam interior, skylights, museum quality lighting, tatami mats, and a comfortable leather bench seat for restful viewing.